I love it when I’m speculating about a relationship, searching for records to back it up, and end up finding the one document that brings it all together! 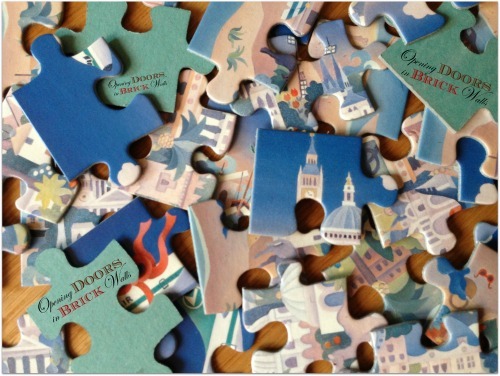 Remember doing jigsaw puzzles as a child? Did you try to connect the pieces even when they didn’t fit? The pieces of my puzzle were all spread out and I was sure they would come together into one picture. 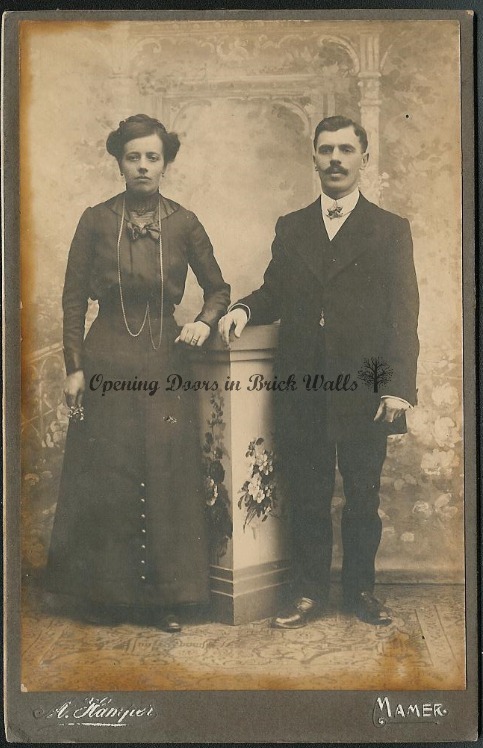 Clara WELTER and Franz ZWANCK are another set of my children’s 5th great-grandparents in the Grand Duchy of Luxembourg. Clara and Franz lived in the town my husband often visited while growing up. Being the oldest grandchild of Suzanne PEFFER and Fritz KREMER he would spend his summer vacation with his grandparents, running around the little village, and playing with the children there. Little did he know, his friends were most likely distantly related to him as many families have deep roots in the little hamlet. 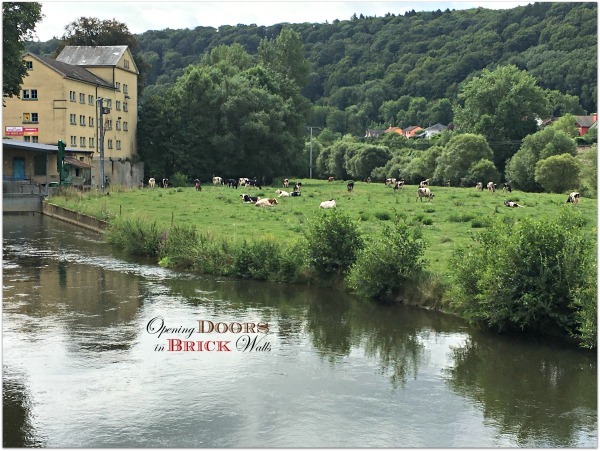 The mill of Moestroff across the Sauer River from the castle and church. 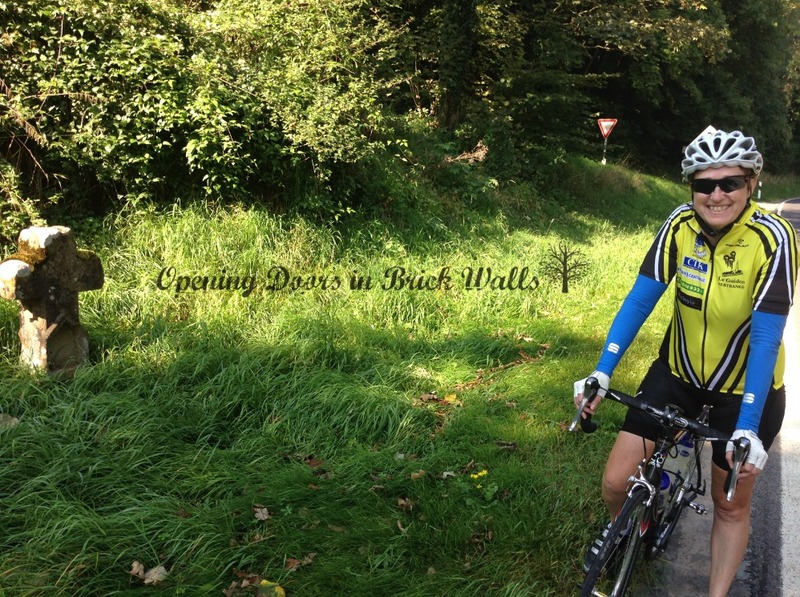 Moestroff is a village which is on one of our main bike routes when riding north of Echternach and we stopped there to take a few photos this week. The church of Moestroff (side view from back) with the priest’s entry door. Franciscus “Franz” ZWANCK was born about 1750 in Moestroff, commune of Bettendorf, district of Diekirch, Grand Duchy of Luxembourg. His estimated date of birth was calculated from the age at death seen in his death record. I believe he may have been born several years after 1750. He was the son of Pierre ZWANG (d. aft. 1789) and Anne Marie HUSCHET (d. bef. 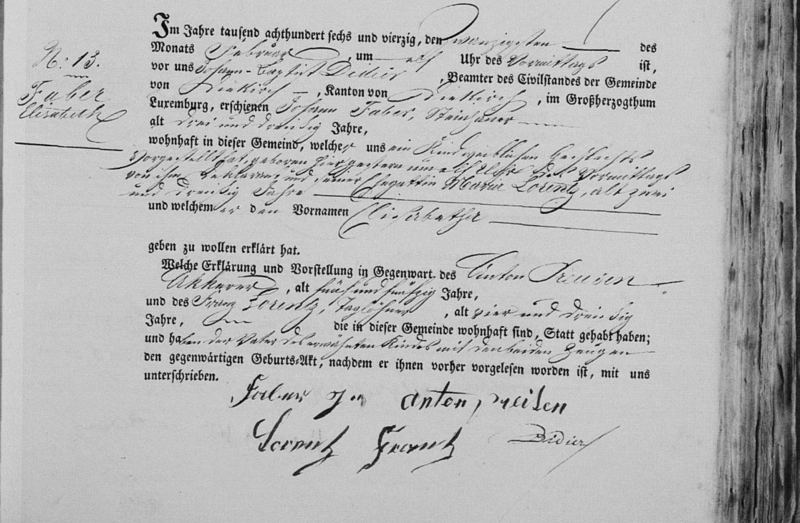 1789) per Franz’s 1789 marriage record. He died on 3 June 1820 in Moestroff. Franciscus married Maria Clara WELTER, daughter of Johann WELTER and Anna Maria FELTES, on 26 October 1789 in Bettendorf. Clara, as she was known, was born on 4 July 1766 in Reisdorf, the fifth of seven children. She died on 25 January 1826 in Moestroff. Peter ZWANK § was born on 19 August 1793 in Moestroff and was baptized the same day in Bettendorf. He died at the age of 3 years on 8 September 1796 in Moestroff. Margreta ZWANG § was born on 22 April 1799 in Moestroff. She lived only eight days dying on 29 April 1799. Maria ZWANG § was born 26 May 1800 and died on 26 January 1815 at the age of 14 years in Moestroff. and died on 18 July 1804 at the age of nearly three months. Both events took place in Moestroff. § is the symbol I use for children who are the end of the line. The additions of Margreta and Maria were only made today. I had found the death record of Maria who died in 1815 and was searching for her birth record when I found Margreta’s birth record. So close in age, I thought they may have been the same person. I continued to search and found the birth record of Maria and the death record of Margaretha proving they were two. Catherine ZWANK was born and baptized on 2 August 1790 in Moestroff. Catherine married Matthias ABENS, son of Théodore ABENS and Susanne HASTERT, on 29 May 1811 in Bettendorf. Matthias was born on 2 January 1785 in Ralingen, Rheinland-Pfalz, Germany. He died on 3 August 1819 in Moestroff. Catherine and Matthias had two children: Christophe (1816-1880) who remained in Moestroff and Anna Maria (1819-aft. 1889) who moved to the Province of Luxembourg in Belgium. 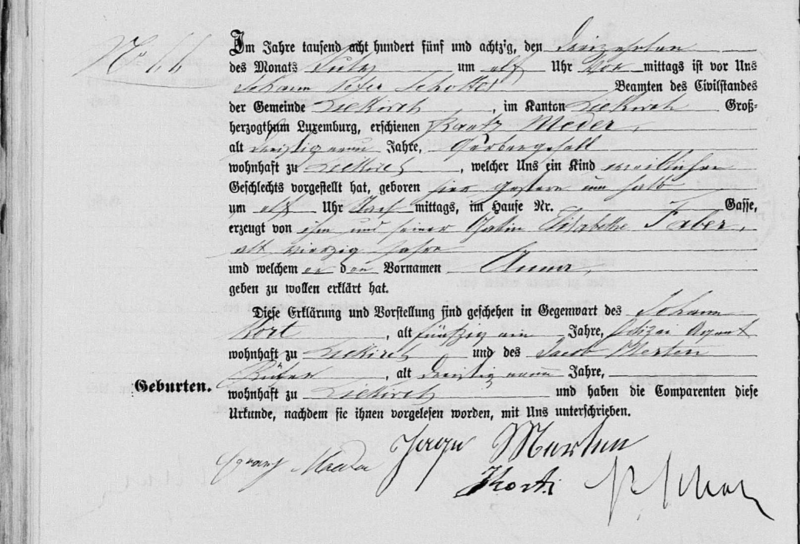 Catherine also married Nicolas WEYLAND, son of Hubert WEYLAND and Marguerite ÖRNTZEN (I believe this name may have later been ERNZEN), on 22 January 1828 in Bettendorf. Nicolas was born on 29 January 1779 in Örntzheim (Nommern). He died on 25 June 1859 in Moestroff. Catherine and Nicolas also had two children: Catharina (1830-1900) who went to live in Paris, France, with her husband and family and Jacques Hubert (1833-aft. 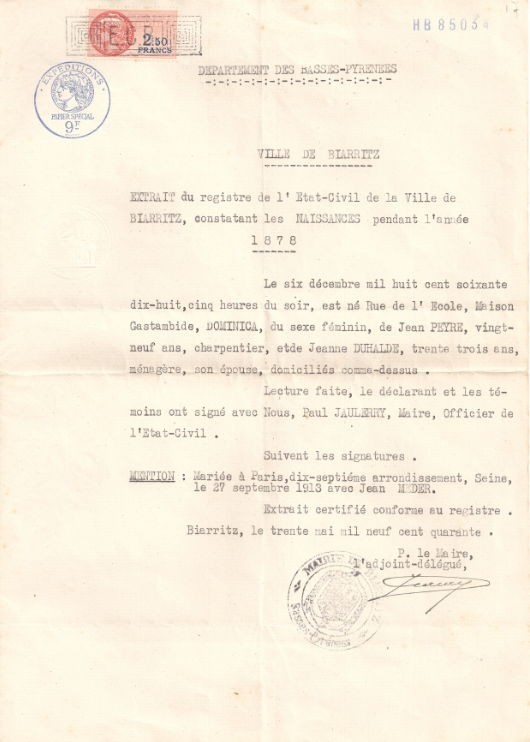 1909) who went to live in the Province of Luxembourg in Belgium with his family. Catherine died on 29 March 1852 in Moestroff. UPDATE: My friend Linda, a researcher in Luxembourg, confirmed: Örntzheim (Nommern) is in fact Ernzen, part of Larochette (also called Feels or in Latin Rupe, all meaning -Little-Rock). Larochette was in the parish of Nommern before the French Revolution. Jacques “Jacob” ZWANK was born on 17 May 1795 in Moestroff and baptized the same day in Bettendorf. Jacques married Maria DAHM, daughter of Pierre “Peter” DAHM and Anne Cathérine KIMMES, on 22 October 1823 in Bettendorf. Maria was born on 10 July 1797 in Moestroff and christened the same day in Bettendorf. Jacob died on 15 February 1858 in Moestroff and Maria died on 28 November 1859 in Moestroff. 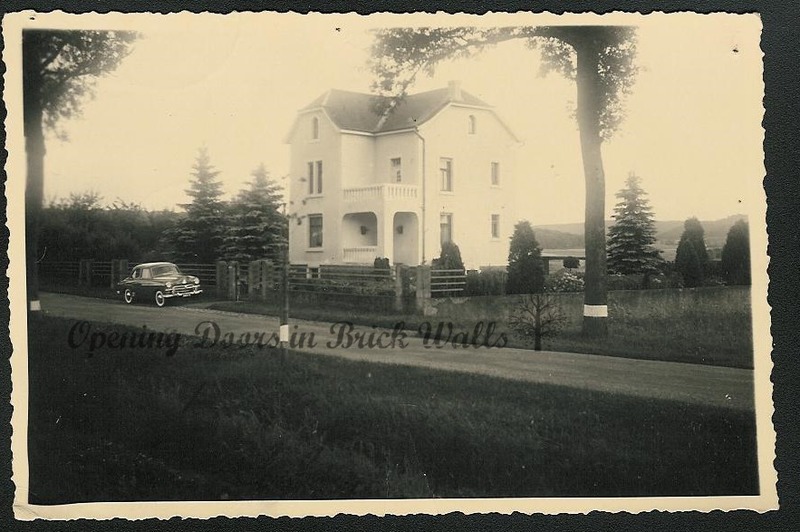 Their story was told in 52 Ancestors: #39 The ZWANK-DAHM Family of Moestroff. Jacob and Maria’s children remained in Moestroff. Johann ZWANCK was born on 26 April 1797 in Moestroff. He died on 28 February 1832 in Vianden. Johann married Cathérine HIERTZ, daughter of Jean HIERTZ and Barbe WEYRICH, on 17 January 1826 in Vianden. Cathérine was born on 2 October 1804 in Vianden Her death record has not been located. Johann and Cathérine had four children: Johann (1826-aft. 1886), Jacob (1828-1898), Wilhelm (1828-1832), Agathe (1831-?). What I do when I have a genealogy puzzle is to add assumed children with TEMPORARILY ATTACHED typed in at the top of their notes to a set of parents in my database. These parents may already have proven children whose timelines are helpful in determining if I am on the right track. I work through each “child” adding information as it is found. If they end up not being connected I can easily detach the child leaving all of the information in my database. I don’t delete the information because, even if it is not useful to me, it may help someone else with their research. The puzzle the ZWANG family presented was partly solved in this way. As you can see in the genealogical information above, the family name was seen with several different spellings: ZWANG, ZWANK, and ZWANCK. I had to be careful that all of these spellings were variations of the same name and not another family name. Before I found the one document that brings it all together! this was what I knew. Pierre ZWANG and Anne Marie HUSCHET may have had at least 4 children. This was speculation on my part. Records were found for a possible son Ludovicus (1748-1776), a possible daughter Irmina Catharina (b. 1750), and sons Franz (b. abt. 1750) and Nicolas (b. 1764). 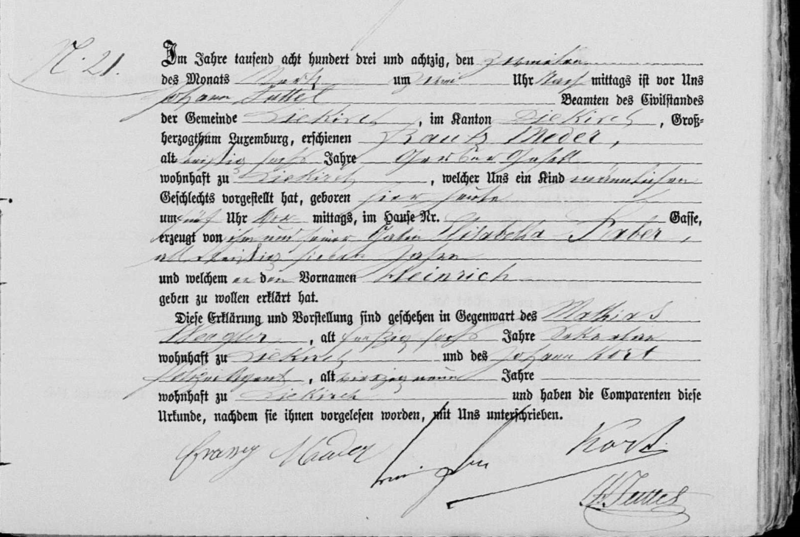 The baptismal records of the first two children DID NOT have the maiden name of the mother – HUSCHET. 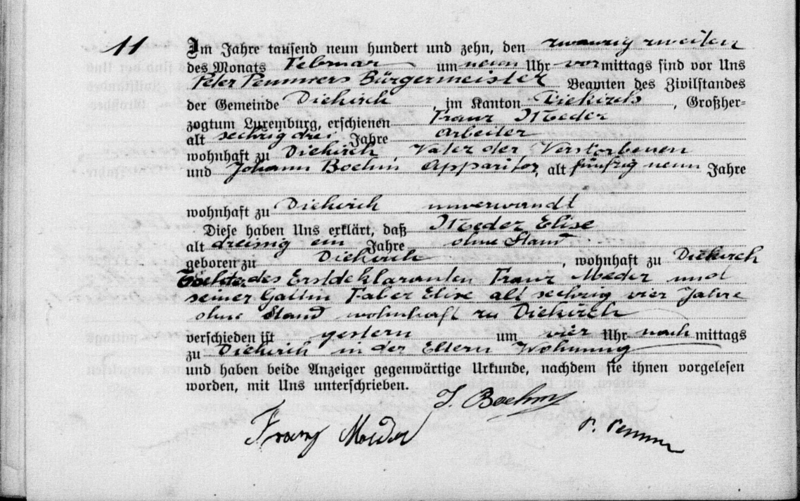 For Franz, the subject of this post, no baptismal record was found however his marriage record gave the maiden name of his mother as HUSCHET. 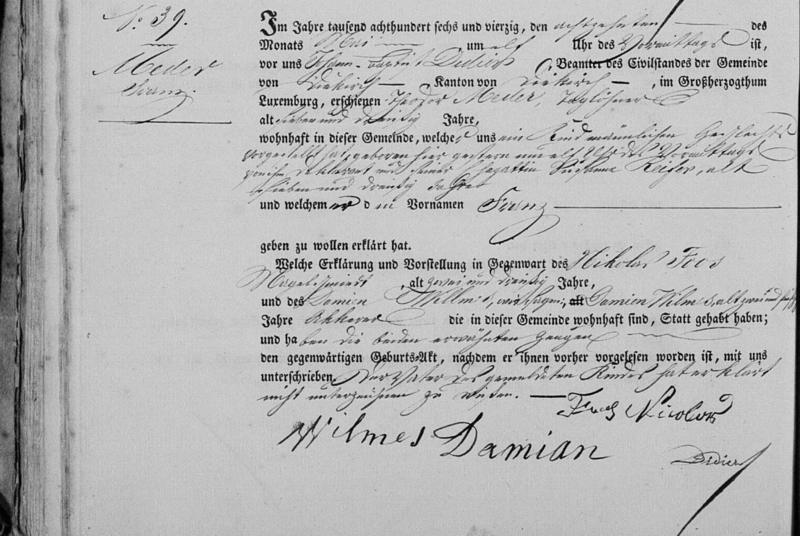 Nicolas’ baptismal record only had Anne Marie as his mother’s name. One avenue I have not considered is that the ZWANG-HUSCHET couple may have had children in another town. 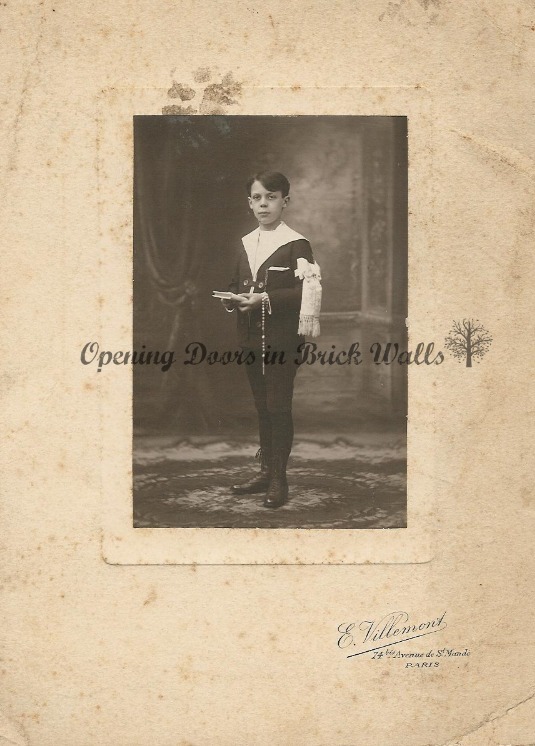 In records found for the HOSCHEID family (which I worked through when I wrote A Priest Born in the 16th Century Leaves a Key to Open the Door in a Brick Wall) the surname HOSCHEID was also spelled HUSCHETE. I may have to re-visit the Brandenbourg records to see if there is a connection. It must be mentioned here that early parish records for Moestroff were found in Reisdorf and later parish records were found in Bettendorf. Unfortunately, there is a period between the two where records are missing. Notably for Bettendorf before 1763. Further speculation on my part was that Irmina Catharina went by Catharina and married Johann KELSCH on 9 March 1777 in Bettendorf. The marriage record does not list parents. Johann KELSCH was the godfather of Franz’s son Johann in 1797. As no age was listed, this Johann KELSCH could have been either the husband of Catharina ZWANG or her son. I found two researchers who list a date of death for Catharina’s husband. The date was 6 March 1798. 1798 Death Record of Pierre ZWANG found on pages 345 and 346 of the civil register of Bettendorf. While searching for the death record of Johann KELSCH (I still have not found it!) I found a death record I had not expected to find. The early civil records for Luxembourg begin in 1796. This is the period in which the Republican Calendar was being used. The date I was searching for, 6 March 1798, would have been 16 Ventôse in the year VI. I found records dated the 3rd and the 20th of the month of Ventôse in the year VI but none in between. One of the death records for the 3rd included the name KELSCH but it was the name of one of the informants and not the person who had died. The civil servant who was likely not very well educated in French made many spellings errors. They were errors he repeated in other entries and therefore likely how he thought they were written. 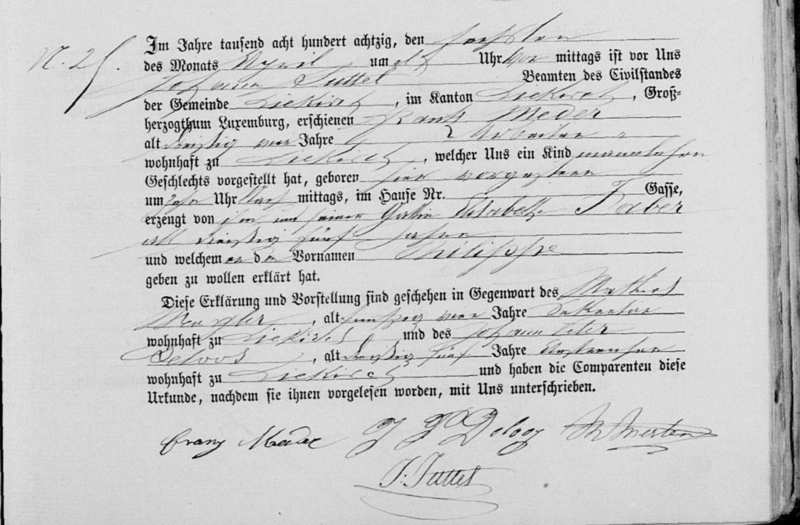 The handwriting and the spelling made it difficult to decipher the document, a death record for Pierre ZWANG, the father of Franz ZWANG. The record clearly states Franz was the son of Pierre but the relationship of Johann KELSCH who was the second informant is not given. However, his age was given as 21 which could only mean he was the son of Catharian ZWANG and Johann KELSCH. From this record, I now know Pierre ZWANG was born about 1728 as his age was 70 years at the time of death on 21 February 1798. The family name ZWANG is a German word which means force. In the end, I did not need to use force to piece the puzzle together. The pieces fell into place although it did take hours of looking through the Luxembourg records, adding the records to my database, and citing the sources. Do you have a similar way of solving the problems you run into in your genealogy research? I hope you’ve enjoyed this visit to Moestroff with the ZWANCK-WELTER family. Luxembourg, Registres d’état civil, 1662-1941 (images), FamilySearch (original records at Luxembourg National Archives, Plateau du Saint-Esprit, Luxembourg), Bettendorf > Mariages 1817-1890 Décès 1800-1859 > image 993 of 1494. 1820 Death Record (age at death 70). (https://familysearch.org/pal:/MM9.3.1/TH-267-12456-37494-69?cc=1709358 : accessed 26 September 2015). Ibid., Bettendorf > Naissances, mariages, décès 1779-1812 > image 112 of 238. 1789 Marriage Record (left page, top). 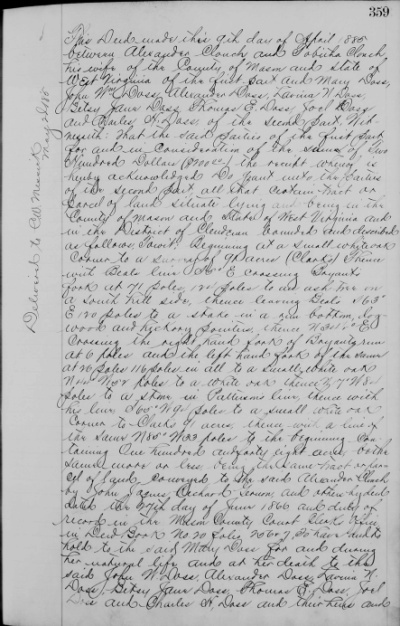 (https://familysearch.org/ark:/61903/3:1:S3HY-DRLB-BM?cc=1709358&wc=9RYW-DP8%3A129626601%2C130236801 : accessed 24 July 2017). Luxembourg, registres paroissiaux, 1601-1948 (images), FamilySearch (original records at Luxembourg National Archives, Plateau du Saint-Esprit, Luxembourg), Reisdorf > Baptêmes 1725-1805, mariages 1763-1805 > image 20 of 59. 1766 Baptismal Record (left page, 5th entry). (https://familysearch.org/ark:/61903/3:1:3QS7-99WS-H9M2-Z?cc=2037955&wc=STHD-RM8%3A1501010555%2C1501010556 : accessed 24 July 2017). Luxembourg Civil Records, Bettendorf > Mariages 1817-1890 Décès 1800-1859 > image 1045 of 1494. 1826 Death Record No. 7. (https://familysearch.org/pal:/MM9.3.1/TH-267-12456-35658-79?cc=1709358 : accessed 26 September 2015). Luxembourg Parish Records, Bettendorf > Baptêmes, mariages, sépultures 1763-1797 > image 47 of 94. 1790 Baptismal Record (right page, 4th entry). (https://familysearch.org/pal:/MM9.3.1/TH-1971-32400-1478-56?cc=2037955&wc=STH6-SPJ:1500974653,1500923326 : accessed 24 September 2015). Luxembourg Civil Records, Bettendorf > Mariages 1817-1890 Décès 1800-1859 > image 1388 of 1494. “.” 1852 Death Record No. 16. (https://familysearch.org/pal:/MM9.3.1/TH-267-12456-37526-82?cc=1709358&wc=9RY8-SP8:129626601,129729901 : accessed 7 Sep 2011). Luxembourg Parish Records, Bettendorf > Baptêmes, mariages, sépultures 1763-1797 > image 53 of 94. 1793 Baptismal Record (last entry on right page). (https://familysearch.org/pal:/MM9.3.1/TH-1961-32400-2766-52?cc=2037955&wc=STH6-SPJ:1500974653,1500923326 : accessed 24 September 2015). Ibid., Bettendorf > Baptêmes, mariages, sépultures 1763-1797 > image 94 of 94. 1796 Death Record (left page, 6th entry). (https://familysearch.org/ark:/61903/3:1:3QSQ-G9WM-MS17?cc=2037955&wc=STH6-SPJ%3A1500974653%2C1500923326 : accessed 24 July 2017). Ibid., Bettendorf > Baptêmes, mariages, sépultures 1763-1797 > image 57 of 94. 1795 Baptismal Record (left, top). (https://familysearch.org/pal:/MM9.3.1/TH-1961-32400-2824-51?cc=2037955&wc=STH6-SPJ:1500974653,1500923326 : accessed 24 September 2015). Luxembourg Civil Records, Bettendorf > Mariages 1817-1890 Décès 1800-1859 > image 1462 of 1494. 1858 Death Record No. 6. (https://familysearch.org/pal:/MM9.3.1/TH-267-12456-36487-72?cc=1709358&wc=M9M6-2ZY:2071013250 : accessed 10 Apr 2013). Luxembourg Parish Records, Bettendorf > Baptêmes, mariages, sépultures 1763-1797 > image 60 of 94. 1797 Baptismal Record. (https://familysearch.org/pal:/MM9.3.1/TH-1971-32400-2625-75?cc=2037955&wc=STH6-SPJ:1500974653,1500923326 : accessed 24 September 2015). Luxembourg Civil Records, Vianden > Mariages 1834-1890 Décès 1797-1866 > image 918 of 1406. 1832 Death Record No. 10. 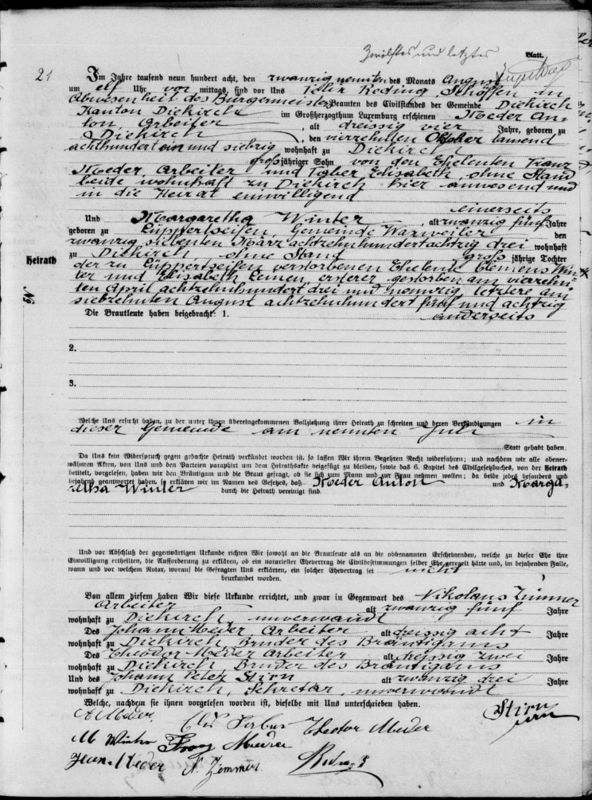 (https://familysearch.org/ark:/61903/3:1:S3HT-DTQS-LJ6?cc=1709358&wc=9RY9-DP8%3A130504801%2C130555401 : accessed 24 July 2017). Ibid., Bettendorf > Naissances, mariages, décès 1779-1812 > image 198 of 238. 1799 (3 Floreal year VII) Birth Record part 1 (right, bottom). (https://familysearch.org/ark:/61903/3:1:S3HY-DRLT-2L?cc=1709358&wc=9RYW-DP8%3A129626601%2C130236801 : accessed 29 July 2017) See also image 199 for part 2. Ibid., Bettendorf > Naissances, mariages, décès 1779-1812 > image 216 of 238. 1799 Death Record ( 9 Floreal year VII). (https://familysearch.org/ark:/61903/3:1:S3HY-DRLL-B8?cc=1709358&wc=9RYW-DP8%3A129626601%2C130236801 : accessed 29 July 2017). Ibid., Bettendorf > Naissances, mariages, décès 1779-1812 > image 227 of 238. 1800 Birth Record No. 19 (6 Prairial year VIII). (https://familysearch.org/ark:/61903/3:1:S3HY-DRLB-RV?cc=1709358&wc=9RYW-DP8%3A129626601%2C130236801 : accessed 29 July 2017). Ibid., Bettendorf > Mariages 1817-1890 Décès 1800-1859 > image 950 of 1494. 1815 Death Record. (https://familysearch.org/pal:/MM9.3.1/TH-267-12456-35621-4?cc=1709358 : accessed 25 September 2015). Ibid., Bettendorf > Naissances 1828-1890 Mariages 1800-1816 > image 1328 of 1507. 1804 Birth Record No. 46 (8 Floreal an XII). (https://familysearch.org/pal:/MM9.3.1/TH-267-13200-175-20?cc=1709358 : accessed 26 September 2015). Ibid., Bettendorf > Naissances 1828-1890 Mariages 1800-1816 > image 1439 of 1507. 1811 Marriage Record (left page, first entry). (https://familysearch.org/ark:/61903/3:1:S3HY-X2MW-CV?cc=1709358&wc=9RYD-FM9%3A129626601%2C129945501 : accessed 24 July 2017). Ibid., Bettendorf > Mariages 1817-1890 Décès 1800-1859 > image 985 of 1494. 1819 Death Recod (left, bottom). (https://familysearch.org/ark:/61903/3:1:S3HY-6RW9-DJV?cc=1709358&wc=9RY8-SP8%3A129626601%2C129729901 : accessed 29 July 2017). Ibid., Bettendorf > Mariages 1817-1890 Décès 1800-1859 > image 166 of 1494. 1828 Marriage Record No. 1. (https://familysearch.org/ark:/61903/3:1:S3HY-6RW9-6C4?cc=1709358&wc=9RY8-SP8%3A129626601%2C129729901 : accessed 24 July 2017). Luxembourg Parish Records, Nommern > Baptêmes 1744-1787, confirmations 1750-1789, mariages 1751-1765, 1769-1787, sépultures 1752-1787 > image 68 of 170. 1779 Baptismal Record (part 1, right page, bottom). (https://familysearch.org/ark:/61903/3:1:3QSQ-G9WS-9SWR?cc=2037955&wc=STHZ-L2V%3A1500981117%2C1501018978 : accessed 29 July 2017). See also image 59 for second part. Luxembourg Civil Records, Bettendorf > Mariages 1817-1890 Décès 1800-1859 > image 1481 of 1494. 1859 Death Record No. 23. (https://familysearch.org/ark:/61903/3:1:S3HY-6RW9-FQH?cc=1709358&wc=9RY8-SP8%3A129626601%2C129729901 : accessed 27 July 2017). Ibid., Bettendorf > Mariages 1817-1890 Décès 1800-1859 > image 82 of 1494. 1823 Marriage Record No. 10. (https://familysearch.org/pal:/MM9.3.1/TH-267-12456-38177-77?cc=1709358&wc=M9M6-2ZY:2071013250 : accessed 10 Apr 2013). Luxembourg Civil Records, Bettendorf > Mariages 1817-1890 Décès 1800-1859 > image 1487 of 1494. 1859 Death Record No. 48. (https://familysearch.org/pal:/MM9.3.1/TH-267-12456-39674-59?cc=1709358&wc=M9M6-2ZY:2071013250 : accessed 10 Apr 2013). Ibid., Vianden > Naissances 1793-1828 > image 113 of 484. 1804 Birth Record (10 vendémiaire an XIII). (https://familysearch.org/ark:/61903/3:1:S3HT-XCWW-SC?cc=1709358&wc=9RYW-SPD%3A130504801%2C130707001 : accessed 29 July 2017). Ibid., Vianden > Naissances 1829-1890 Mariages 1797-1833 > image 1437 of 1493. 1826 Marriage Record No. 2. (https://familysearch.org/ark:/61903/3:1:S3HY-DTCS-W58?cc=1709358&wc=9RY4-929%3A130504801%2C130760501 : accessed 24 July 2017). Ibid., Bettendorf > Naissances, mariages, décès 1779-1812 > image 179 of 238. 1798 Death Record part 1 (3 ventôse an VI) (right, bottom). (https://familysearch.org/ark:/61903/3:1:S3HY-DRL1-Y1?cc=1709358&wc=9RYW-DP8%3A129626601%2C130236801 : accessed 29 July 2017). See also image 180 for second part. None of my American ancestors took advantage of the Homestead Act. But homesteading is not restricted to settling on goverment land and farming it. Homesteading was and is a lifestyle of self-sufficiency. 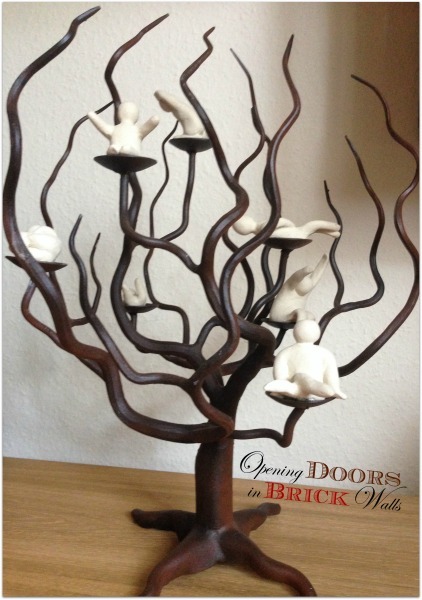 The farther back we go in our families trees the more independent our ancestors were. They provided for themselves through farming, hunting, home preservation of foodstuffs, and, in the case of my 2nd great-granfather Jean FRANTZ, a linenweaver, the production of textiles. 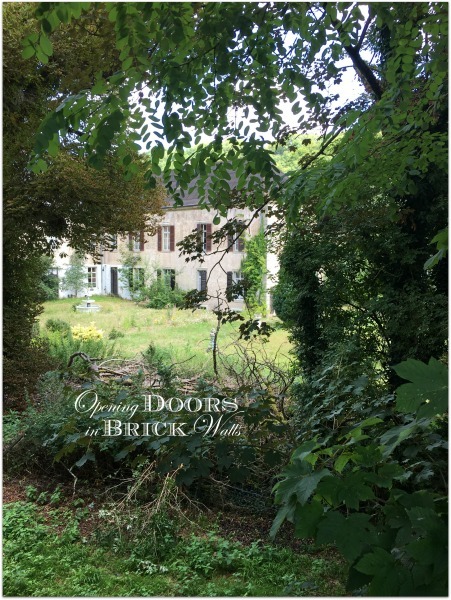 While we are on the subject of homesteading and ancestral homes, when I was a child we visited a FRANTZ family in Mamer, Luxembourg, to watch a bicycle race. I have no idea if the house was lived in by my FRANTZ ancestors, i.e. an ancestral home. At the time I was also unaware of the significance and the connections between FRANTZ, the town of Mamer and cycling. Family tradition, once we genealogists get involved, is often debunked. However the story of my grandmother being a cousin of the famous Tour de France winner was proven true. My grandmother Marie Marcelle FOURNELLE (1909-2005) and Nicolas FRANTZ (1899-1985) were 3rd cousins – not quite as close as the story told. Their common ancestors were Paulus FRANTZ (1763-1847) and his wife Susanne KEIFFER (1754-1808). Nicolas FRANTZ took second place in the Tour de France in 1924 and 1926 and was the winner of the tour in 1927 and 1928. In 1928 Nicolas was the first, and to date only winner of the Tour de France, to wear the maillot jaune, the yellow jersey, during the entire 20 days of the race, from the first day, due to his being the previous year’s winner, to the last day. Having a Tour de France winner as a cousin is amazing. Even more so is I actually enjoy the same sport he excelled in. This is quite a statement for a girl who did everything to get out of doing sports while growing up. Posing with my bicycle when I hit the 5,000 km mark last year. I was so pleased it happened at this particular spot – a reminder of my “other” hobby – genealogy. My 2nd great-grandfather Jean FRANTZ was born in Mamer on 3 December 1837 to Jean FRANTZ (1794-1880) and his wife Elisabeth “Elise” FRISCH (1800-1880). On 16 February 1870 he married Marie MAJERUS. Marie was born in Mamer on 19 June 1850 to Jean MAJERUS (1817-1887) and his wife Marie TRAUSCH (1820-1875). The young couple lived with Marie’s parents in 1871 and with her widowed father in 1875. 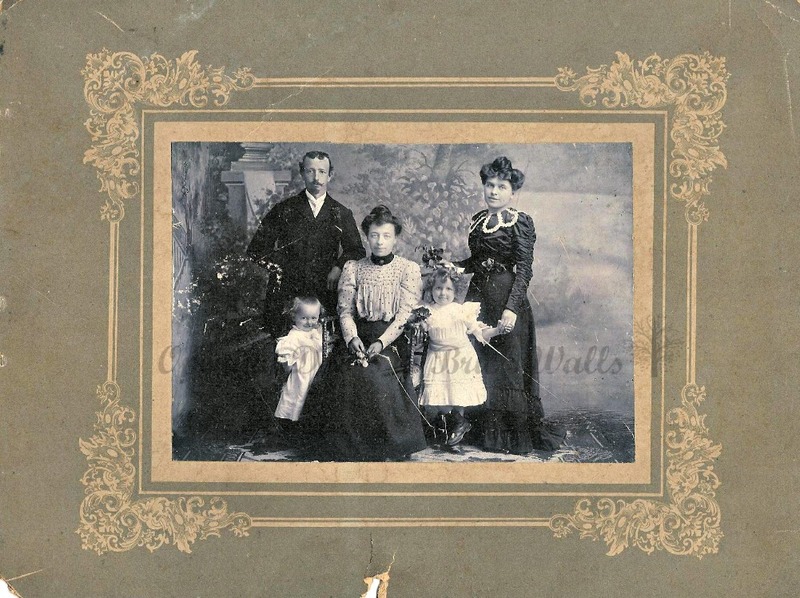 Census records indicate Marie was the only child of the MAJERUS-TRAUSCH couple. By 1880 Jean FRANTZ and his wife had their own household. Marie’s widowed father lived with them in 1880, 1885, and 1887. 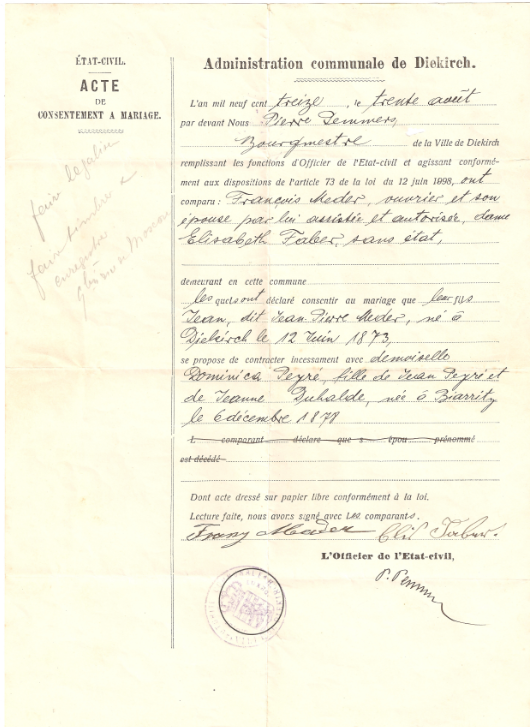 Jean and Marie continued to be enumerated as a family in Mamer in the census in 1890, 1895, and 1900. From 1858 to 1900 Jean’s occupation was a linen weaver. They lived in the “Brücke bis Weweschgâss” area of Mamer. At the time mostly farm land, today this is a residential area. 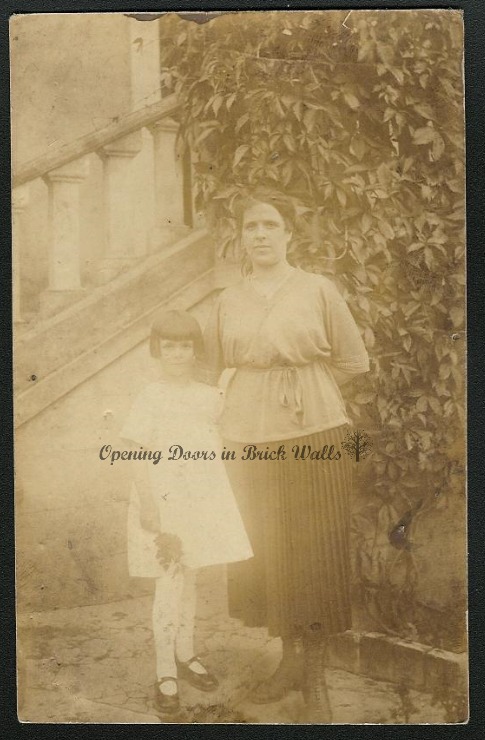 When Jean and Marie’s children married the occupation of the parents was consistently listed as farmers, Ackerer or Ackerleute, on the marriage records for the period 1892 to 1916. When Jean died on 24 February 1929, in his 92nd year, his occupation was cultivateur or farmer in his obituary. Jean was survived by his wife Mrs. Jean FRANTZ, née Marie MAJERUS; his children Mrs. Jos. FOURNELLE, née Cath. FRANTZ; Mrs. Paul GERSTEL, née Joséphine FRANTZ; Jean FRANTZ; Mrs. François VESQUE, née Pauline FRANTZ; Jean-Pierre FRANTZ; Mrs. Théophile HILBERT, née Marguerite FRANTZ; and Joseph FRANTZ. His wife Marie died two years later, on 13 September 1931 in her 82nd year. For Jean’s widow Marie, the same children were listed. 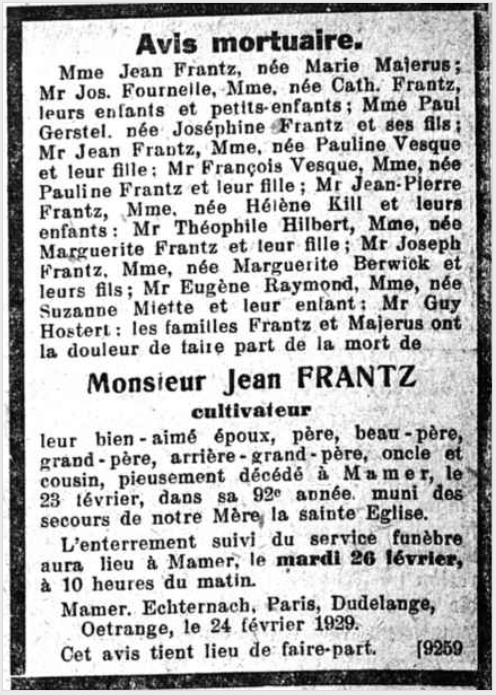 Missing in both obituaries is the oldest daughter Marie FRANTZ who predeceased her parents. Suzanne MIETTE and Guy HOSTERT, listed after the children of Jean and Marie, were Marie FRANTZ’s children. Marie FRANTZ was born 11 January 1871 in Mamer. She lived at home with her parents and siblings until about 1885 when she went to Metz, France, to work as a servant. In February 1887 she was still in Metz and by the next year, she took a position in Reims, France, where she was working in 1890. By 1895 she was no longer mentioned in her parents’ household on the census suggesting she married between 1891-1895. Her marriage to Eugène Léon MIETTE was found in the 2e Arrondissement of Paris. They were married on 21 June 1892 and divorced on 16 July 1906. They had a daughter Suzanne Léonide Jeanne Marie MIETTE born in 1895. After her divorce, Marie married Mr. (given names unknown) HOSTERT and had a son Guy HOSTERT who was photographed in Paris, France, at the time of his Communion in 1921. Marie died before 24 February 1929. Catharine FRANTZ, my great-grandmother, was born on 17 November 1872. She lived at home with her parents and siblings until about 1889 when she went to Arlon, Belgium, to work as a servant. Soon after December 1890, she began working in Reims, France, where she lived when the census was enumerated in December 1895. 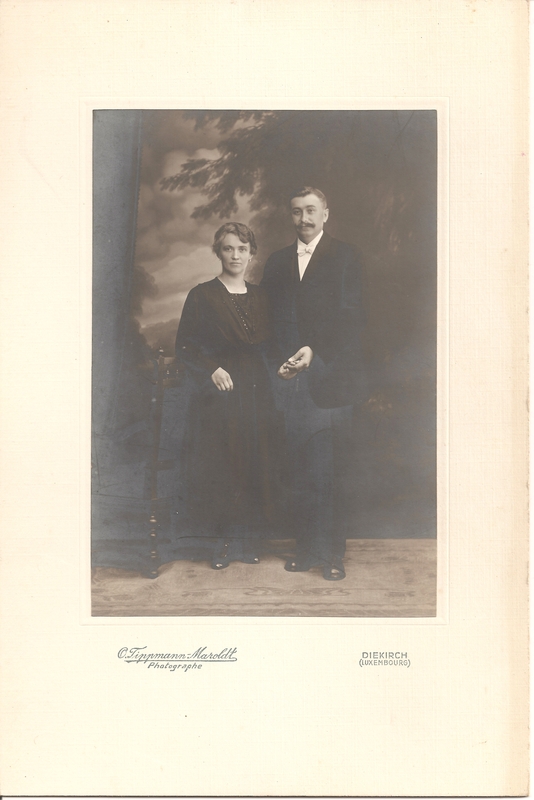 She was back home in Mamer on 9 July 1900 when she married Jean Joseph FOURNELLE, my great-grandfather. She went with her newlywed husband to live in Echternach where she raised three children. She died 16 March 1834 in Echternach. The FOURNELLE-FRANTZ family (ca. 1906) before my grandmother was born. The children André (left) and Lucie (right) with (from left to right) Joseph FOURNELLE, his wife Catherine FRANTZ and her sister Pauline FRANTZ. Catharina Joséphine FRANTZ was born 25 September 1874. She went by Joséphine. She lived at home with her parents and siblings until about 1893 when she went to work in Reims, France. She married Paul GERSTEL in 1900 and had two sons, Pierre and Jean. Her husband died before 24 February 1929. The family lived in Paris, France. Joséphine was living with her younger son Jean and his family on 1 January 1946. It is not known when she died. Johann FRANTZ was born 22 July 1876. He lived at home with her parents and siblings until about 1894 when he went to work in Reims, France. In December 1900 he had been in Esch-sur-Alzette for three months. A half a dozen years later he married Pauline VESQUE on 27 August 1906 in Contern. They had one daughter Daisy. Jean died 20 May 1946 in Dudelange. He was a retired postal worker decorated with the Order of the Oak Crown (l’Ordre Grand Ducal de la Couronne de Chêne). His wife Pauline died on 29 November 1956 in Hastière-Lavaux, Belgium. 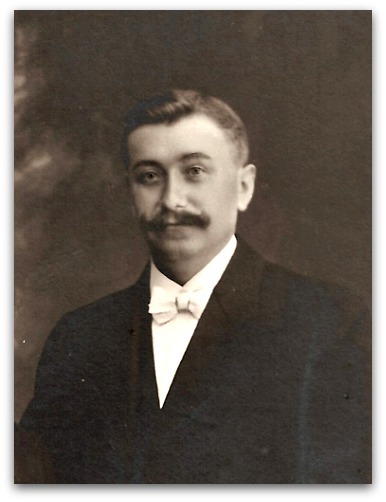 Jean Pierre FRANTZ was born on 28 June 1878 and died 8 February 1879 at the home of his parents. He died at the age of 2/3 year per his death record. Paulina FRANTZ was born on 29 June 1880. In December 1880 when the census was enumerated she was listed as a son named Paul. She went by Pauline. She lived at home with her parents and siblings until about 1897 when she went to work in Reims, France. She may have lived with her sister Catharine and her family in Echternach around 1906 as she was included in a family portrait (seen above under #2). On 15 May 1910 Pauline married Johann Peter François “Franz” VESQUE. Franz worked for the railroad, Chemins de Fer Luxembourgeois. Pauline and Franz had one daughter Maisy who served time in prison for killing a man and never married. The family lived in Oetrange in the commune of Contern. Franz died 11 Feb 1964 in Oetrange and Pauline died 27 December 1966 in Luxembourg City. Their daughter Maisy died in April 1969. Johann Peter FRANTZ was born 14 October 1882. Johann Peter married Hélène KILL on 2 April 1913 in Mamer. They were the parents of three children: Jos, Paul, and Anna Maria. Their son Paul continued the family tradition of cycling. In 1936 he participated in the Olympic Games in Berlin, representing Luxembourg along with three other cyclists in the individual and team road race events. Johann Peter died 1 December 1970 in Luxembourg City. His widow Hélène died 12 October 1972, also in Luxembourg City. Maria Margaretha FRANTZ was born 12 March 1885 in Mamer. She went by Marguerite. She married Johann Theophile “Théo” HILBERT on 25 October 1908 in Mamer. In 1915 their only daughter Margot Thea was born. Marguerite’s husband Théo was the driver of the car owned by Nicolas Frantz I (Tour de France winner) involved in two accidents in 1927, the first resulting in the death of a young boy and the second in the death of Nicolas Frantz II. Théo died 3 January 1946 in Mamer. His widow Marguerite died 22 March 1977 in Mamer. Nicolas FRANTZ was born 16 April 1886. He lived only a month, dying on 18 May 1886 at his parents’ home in Mamer. Johann-Joseph FRANTZ was born 4 September 1888. He married Marguerite BERWICK on 24 April 1916 in Mamer. They were the parents of two sons, Erny and Germain, born in Dudelange where the family lived. Johann-Joseph, also known as “Jos” was a teacher. He died 23 April 1940 in Dudelange. His widow Marguerite died seven months later on 28 November 1940. 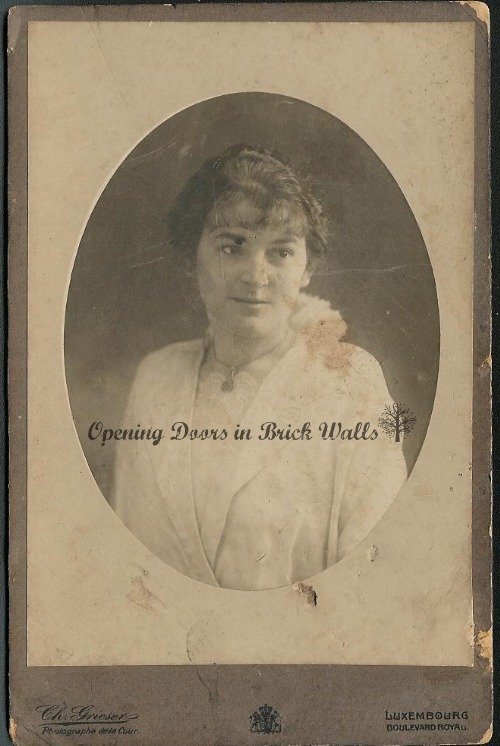 Without the photographs, newspaper clippings, thank you notes, funeral cards and other memorabilia saved by my maternal grandmother I would not have been able to tell their story in such detail. Questions remain and may lead to new stories. I want to know more about Maisy VESQUE who served time in prison for killing a man. I’ve found newspaper articles about the deaths caused by Theo HILBERT when he was driving the car owned by Nicolas FRANTZ. A third question, I was able to answer and in doing so learned a new lesson. 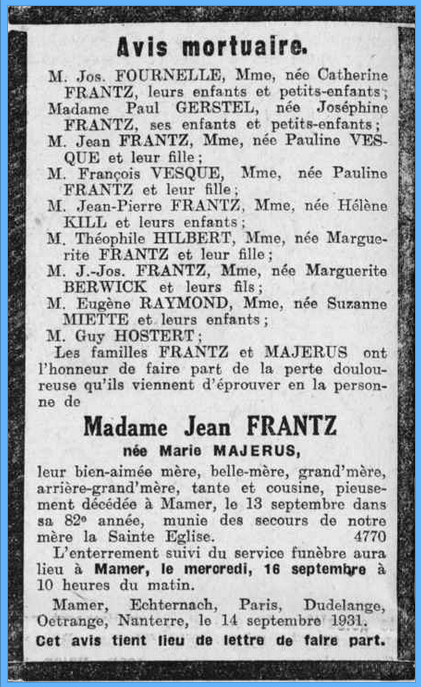 I don’t know how many times I have asked myself who are “Mr Eugène Raymond, Mme, née Suzanne Miette et leur(s) enfant(s)” mentioned in Jean and Marie FRANTZ-MAJERUS’ obituaries? I knew Guy Hostert was the son of their deceased oldest daughter, Marie. Eugène or Suzanne had to be their grandchild and, since great-grandchildren were also mentioned, he or she had to have been born to one of the oldest daughters. I don’t give up easily and the question took me to the online archives of the cities of Reims and Paris, France. Finding records in large cities is daunting. My persistence paid off. 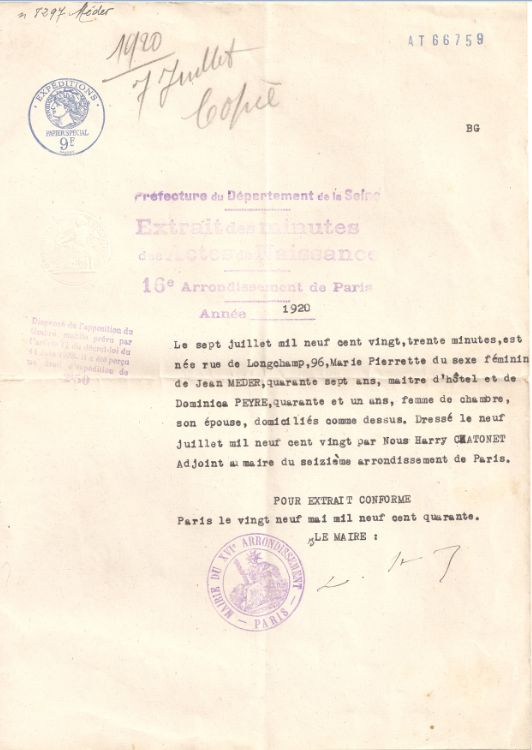 I found the records I needed to prove the relationship of Suzanne MIETTE and in doing so also learned how to use the Archives of Paris database. If anyone is interested, feel free to leave a comment and I may write a post on how to use the Archives de Paris site. Luxembourg, Registres d’état civil, 1793-1923 (images), FamilySearch (original records at Luxembourg National Archives, Plateau du Saint-Esprit, Luxembourg), Mamer > Naissances 1834-1890 Mariages 1796-1837 > images 76 of 1504. 1837 Birth Record No. 58. (https://familysearch.org/pal:/MM9.3.1/TH-266-12585-49242-69?cc=1709358&wc=M9M6-L31:496689502 : accessed 09 Feb 2013). Ibid., Mamer > Mariages 1838-1890 Décès 1796-1880 > image 310 of 1497. 1870 Marriage Record No. 5. (https://familysearch.org/pal:/MM9.3.1/TH-266-12143-120441-3?cc=1709358&wc=9RY3-VZ9:130065401,130130201 : accessed 6 September 2014). Ibid., Mamer > Naissances 1834-1890 Mariages 1796-1837 > image 311 of 1504. 1850 Birth Record No. 30. (https://familysearch.org/pal:/MM9.3.1/TH-266-12585-50928-75?cc=1709358&wc=9RY7-FM9:130065401,130365601 : accessed 27 March 2010). Luxembourg, Volkszählungen 1843-1900 (images), FamilySearch (original records at Luxembourg National Archives, Plateau du Saint-Esprit, Luxembourg), Mamer > 1871 > image 518 of 840. Majerus-Trausch household No. 56. (https://familysearch.org/pal:/MM9.3.1/TH-1942-32379-26802-46?cc=2037957&wc=M5G9-SPN:345860401,345869501 : accessed 18 June 2015). Ibid., Mamer > 1875 > image 462 of 795. Johann Majerus household No. 29. (https://familysearch.org/pal:/MM9.3.1/TH-1971-32374-4220-81?cc=2037957&wc=M5LB-K6V:345860401,345870501 : accessed 18 June 2015). Ibid., Mamer > 1880 > image 231 of 803. Frantz-Majerus household No. 65. (https://familysearch.org/pal:/MM9.3.1/TH-1951-32391-9005-98?cc=2037957&wc=M5G7-16N:345860401,345872201 : accessed 18 June 2015). Ibid., Mamer > 1885 > image 41 of 829. Frantz-Majerus household No. 11. (https://familysearch.org/pal:/MM9.3.1/TH-1971-32390-5896-81?cc=2037957&wc=M5G7-GP8:345860401,345873701 : accessed 18 June 2015). Ibid., Mamer > 1887 > image 715 of 828. Frantz-Majerus household No. 30. (https://familysearch.org/pal:/MM9.3.1/TH-1961-32393-787-37?cc=2037957&wc=M5GC-Y4J:345860401,345875201 : accessed 18 June 2015). Ibid., Mamer > 1890 > image 352 of 822. Frantz-Majerus household No. 24. (https://familysearch.org/pal:/MM9.3.1/TH-1971-32393-2887-86?cc=2037957&wc=M5G4-PT1:345860401,345876401 : accessed 18 June 2015). Ibid., Mamer > 1895 > image 820 of 841. Frantz-Majerus household No. 34. (https://familysearch.org/pal:/MM9.3.1/TH-1951-32395-6413-90?cc=2037957&wc=M5G6-L27:345860401,345878001 : accessed 18 June 2015). Ibid., Mamer > 1900 (n 1662) > images 332 of 564. Frantz-Majerus household No. 33. (https://familysearch.org/pal:/MM9.3.1/TH-1942-32398-5686-98?cc=2037957&wc=M9MV-9T2:1997661504 : accessed 21 June 2015). Luxemburger Wort, digitized by the Bibliothèque nationale de Luxembourg, http://www.eluxemburgensia.lu (Verlage der St-Paulus-Druckerei, Luxembourg), No. 56, February 25, 1929, p. 4 column 5. Avis mortuaire for Jean Frantz. (http://www.eluxemburgensia.lu/webclient/DeliveryManager?application=DIRECTLINK&custom_att_2=simple_viewer&pid=1360603&search_terms=Frantz#panel:pp|issue:1360603|article:DTL341|query:Frantz : accessed 20 June 2015). Escher Tageblatt, digitized by the Bibliothèque nationale de Luxembourg, http://www.eluxemburgensia.lu (Verlag Editpress S.A., Esch-sur-Alzette), No. 243, Monday, 14 September 1931, p. 4 column 5. Avis Mortuaire for Madame Jean Frantz née Marie Majerus. (http://www.eluxemburgensia.lu/webclient/DeliveryManager?application=DIRECTLINK&custom_att_2=simple_viewer&pid=510394&search_terms=Frantz#panel:pp|issue:510394|article:DTL278|query:Frantz : accessed 20 June 2015). Luxembourg Civil Records, Mamer > Naissances 1834-1890 Mariages 1796-1837 > image 713 of 1504. 1871 Birth Record No. 4. (https://familysearch.org/pal:/MM9.3.1/TH-266-12585-52216-6?cc=1709358&wc=9RY7-FM9:130065401,130365601 : accessed 23 March 2010). Registres d’actes d’état civil 1860-1902 (images), Archives de Paris (original records in the Archives de Paris, Paris, France. Images from this site are not allowed to be shared with others, used on the internet, or for commercial purposes without permission), Mariages, 2e arr., 21/06/1892. V4E 5486 image 67 of 141. 1892 Marriage Record No. 396. (http://canadp-archivesenligne.paris.fr/archives_etat_civil/1860_1902_actes/ : accessed 20 June 2015). Ibid., Naissances, 3e arr., 14/08/1895. V4E 8167 image of 66 of 159. 1895 Birth Record No. 1164. (http://canadp-archivesenligne.paris.fr/archives_etat_civil/1860_1902_actes/ : accessed 20 June 2015). Luxembourg Civil Records, Mamer > Naissances 1834-1890 Mariages 1796-1837 > image 746 of 1504. 1871 Birth Record No. 57. (https://familysearch.org/pal:/MM9.3.1/TH-266-12585-52481-73?cc=1709358&wc=9RY7-FM9:130065401,130365601 : accessed 23 March 2010). Ibid., Mamer > Naissances, mariages 1895-1923 > image 547 of 819. 1900 Marriage Record No. 18. (https://familysearch.org/pal:/MM9.3.1/TH-1971-32045-16170-78?cc=1709358&wc=M9M6-LQS:415858536 : accessed 6 March 2015). Luxembourg Civil Records, Mamer > Naissances 1834-1890 Mariages 1796-1837 > image 788 of 1504. 1874 Birth Record No. 53. (https://familysearch.org/pal:/MM9.3.1/TH-266-12585-48262-71?cc=1709358&wc=9RY7-FM9:130065401,130365601 : accessed 17 August 2011). Luxembourg Civil Records, Mamer > Naissances 1834-1890 Mariages 1796-1837 > image 828 of 1504. 1876 Birth Record No. 42. (https://familysearch.org/pal:/MM9.3.1/TH-266-12585-51331-4?cc=1709358&wc=9RY7-FM9:130065401,130365601 : accessed 23 March 2010). Ibid., Contern > Mariages 1895-1923 > image 80 of 195. 1906 Marriage Record No. 7. (https://familysearch.org/pal:/MM9.3.1/TH-1951-32037-2967-13?cc=1709358&wc=9RTB-MNB:129626701,129649201 : accessed 7 March 2015). Luxemburger Wort, digitized by the Bibliothèque nationale de Luxembourg, http://www.eluxemburgensia.lu (Verlage der St-Paulus-Druckerei, Luxembourg), No.142, Wednesday, 22 May 1946, p. 3 column 2. Avis mortuaire for Jean Frantz. (http://www.eluxemburgensia.lu/webclient/DeliveryManager?application=DIRECTLINK&custom_att_2=simple_viewer&pid=798376&search_terms=jean%20frantz#panel:pp|issue:798376|article:DTL479|query:jean frantz : accessed 20 June 2015). Collection of newspaper clippings in the possession of Marie Marcelle Fournelle (dec’d). Luxembourg Civil Records, Mamer > Naissances 1834-1890 Mariages 1796-1837 > image 867 of 1504. 1878 Birth Record No. 25. (https://familysearch.org/pal:/MM9.3.1/TH-266-12585-48039-70?cc=1709358&wc=9RY7-FM9:130065401,130365601 : accessed 23 March 2010). Ibid., Mamer > Mariages 1838-1890 Décès 1796-1880 > image 1466 of 1497. 1879 Death Record No. 4. (https://familysearch.org/pal:/MM9.3.1/TH-266-12143-119884-11?cc=1709358&wc=9RY3-VZ9:130065401,130130201 : accessed 23 March 2010). Ibid., Mamer > Naissances 1834-1890 Mariages 1796-1837 > image 911 of 1504. 1880 Birth Record No. 35. (https://familysearch.org/pal:/MM9.3.1/TH-266-12585-49264-59?cc=1709358&wc=9RY7-FM9:130065401,130365601 : accessed 23 March 2010). Ibid., Mamer > Naissances, mariages 1895-1923 > image 659 of 819. 1910 Marriage Record No. 4. (https://familysearch.org/pal:/MM9.3.1/TH-1961-32045-18508-90?cc=1709358&wc=9RTB-L2D:130065401,130400801 : accessed 7 February 2013). Luxembourg Civil Records, Mamer > Naissances 1834-1890 Mariages 1796-1837 > image 960 of 1504. 1882 Birth Record No. 47. (https://familysearch.org/pal:/MM9.3.1/TH-266-12585-52416-80?cc=1709358&wc=9RY7-FM9:130065401,130365601 : accessed 23 March 2010). Ibid., Mamer > Naissances, mariages 1895-1923 > image 693 of 819. 1913 Marriage Record No. 3. (https://familysearch.org/pal:/MM9.3.1/TH-1961-32045-18126-68?cc=1709358&wc=M9M6-LQS:415858536 : accessed 20 June 2015). Ibid., Mamer > Naissances, mariages 1895-1923 > image 350 of 819. 1914 Birth Record No. 1. (https://familysearch.org/pal:/MM9.3.1/TH-1951-32045-17474-71?cc=1709358&wc=M9M6-LQS:415858536 : accessed 21 June 2015). Ibid., Mamer > Naissances, mariages 1895-1923 > image 375 of 819. 1915 Birth Record No. 29. (https://familysearch.org/pal:/MM9.3.1/TH-1951-32045-17296-67?cc=1709358&wc=M9M6-LQS:415858536 : accessed 21 June 2015). Ibid., Mamer > Naissances, mariages 1895-1923 > image 403 of 819. 1917 Birth Record No. 15. (https://familysearch.org/pal:/MM9.3.1/TH-1961-32045-16310-62?cc=1709358&wc=M9M6-LQS:415858536 : accessed 21 June 2015). Luxembourg Civil Records, Mamer > Naissances 1834-1890 Mariages 1796-1837 > image 1012 of 1504. 1885 Birth Record No. 15. (https://familysearch.org/pal:/MM9.3.1/TH-266-12585-49798-98?cc=1709358&wc=9RY7-FM9:130065401,130365601 : accessed 23 March 2010). Ibid., Mamer > Naissances, mariages 1895-1923 > image 641 of 819. 1908 Marriage Record No. 21. (https://familysearch.org/pal:/MM9.3.1/TH-1971-32045-18301-7?cc=1709358&wc=M9M6-LQS:415858536 : accessed 7 February 2013). Ibid., Mamer > Naissances, mariages 1895-1923 > image 379 of 819. 1915 Birth Record No. 41. (https://familysearch.org/pal:/MM9.3.1/TH-1961-32045-16366-78?cc=1709358&wc=9RTB-L2D:130065401,130400801 : accessed 21 June 2015). Luxembourg Civil Records, Mamer > Naissances 1834-1890 Mariages 1796-1837 > image 1037 of 1504. 1886 Birth Record No. 25. (https://familysearch.org/pal:/MM9.3.1/TH-266-12585-52526-85?cc=1709358&wc=9RY7-FM9:130065401,130365601 : accessed 23 March 2010). Ibid., Mamer > Décès 1881-1890 > image 75 of 144. 1886 Death Record No. 17. (https://familysearch.org/pal:/MM9.3.1/TH-267-12699-120456-21?cc=1709358&wc=9RY8-GPF:130065401,129686301 : accessed 20 August 2011). Ibid., Mamer > Naissances 1834-1890 Mariages 1796-1837 > image 1092 of 1504. 1888 Birth Record No. 56. (https://familysearch.org/pal:/MM9.3.1/TH-266-12585-49208-71?cc=1709358&wc=9RY7-FM9:130065401,130365601 : accessed 23 March 2010). Ibid., Dudelange > Mariages 1910-1920 > image 313 of 548. 1916 Marriage Record No. 14. (https://familysearch.org/pal:/MM9.3.1/TH-1971-32026-13839-79?cc=1709358&wc=9RTY-JWG:129625901,129908301 : accessed 5 March 2015). Ibid., Dudelange > Naissances 1915-1923 > image 273 of 611. 1919 Birth Record No. 102. (https://familysearch.org/pal:/MM9.3.1/TH-1961-32040-5639-58?cc=1709358&wc=9RTB-4W1:129625901,130608101 : accessed 21 June 2015). Ibid., Dudelange > Naissances 1915-1923 > image 406 of 611. 1921 Birth Record No. 86. (https://familysearch.org/pal:/MM9.3.1/TH-1951-32040-5586-45?cc=1709358&wc=9RTB-4W1:129625901,130608101 : accessed 5 March 2015). To give me a little break from serious research and writing, I’m sharing documents my husband’s cousin re-discovered a few weeks ago while cleaning out their Rumpelkammer or débarras [one of those catch-all rooms]. 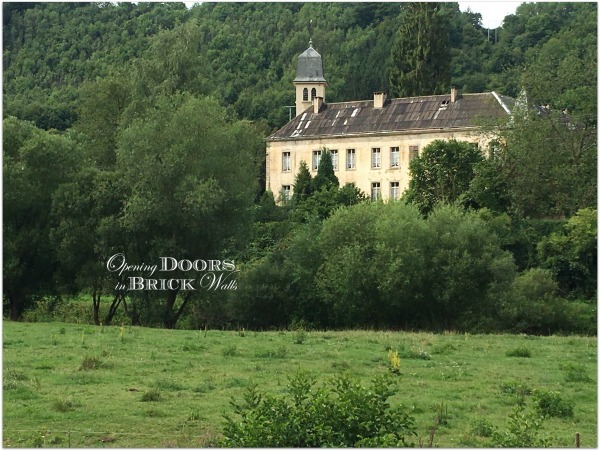 In 52 Ancestors: #5 The MEDER-FABER Family of Diekirch 1846-1954 I wrote about my husband’s great-grandparents Franz MEDER (1846-1930) and Elisabeth FABER (1846-1915). They had three sons with the same name – Johann Peter MEDER. The middle one was born 14 October 1876 and died 29 September 1877, shortly before his first birthday. The two other sons, with the same name, lived to marry and have children so it was not the case of a child being named after a child who had died. 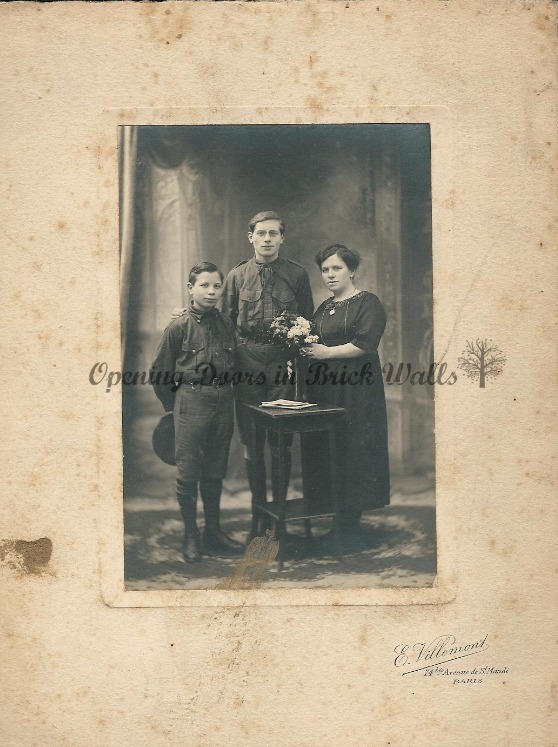 The youngest of the two was my husband’s grandfather (left) Johann Peter MEDER (1888-1954) who I wrote about in 52 Ancestors: #2 The Brewery Worker and the Midwife. The other one was . . .
Johann Peter, the elder, remained in Paris, married and had at least one child, a daughter Pierette who was born ca. 1920-1925. I suspected this but needed confirmation. I met Pierette and her husband in the late 1970s or early 1980s when they came from France to visit with my husband’s uncle Fritz and we saw them several times before Pierette’s death. At the time I knew that she was Fritz’s and my father-in-law’s cousin. By process of elimination I figured out that she had to be the daughter of the elder Johann Peter. My husband’s cousin confirmed that Pierette was the daughter of the brother who lived in Paris but she does not know when he died. After talking to my husband’s cousin, she and her husband began cleaning out a room in their house and found documents that she share with me. What a find!! As mentioned above, the elder Johann Peter MEDER, born 12 June 1873, lived and worked in Paris. He was known as Jean MEDER and worked as a Maître d’Hotel or butler for the family of the Marquis Gustave Lannes de Montebello (1838-1907), French Ambassador, like his father before him, to Russia in Saint Petersburg in 1891-1902. Following the death of the Marquis, Jean remained in the employ of the Marquise de Montebello and her family. An extract of the original 1913 marriage record obtained on 31 May 1940 by Jean and Dominica for an unknown purpose. 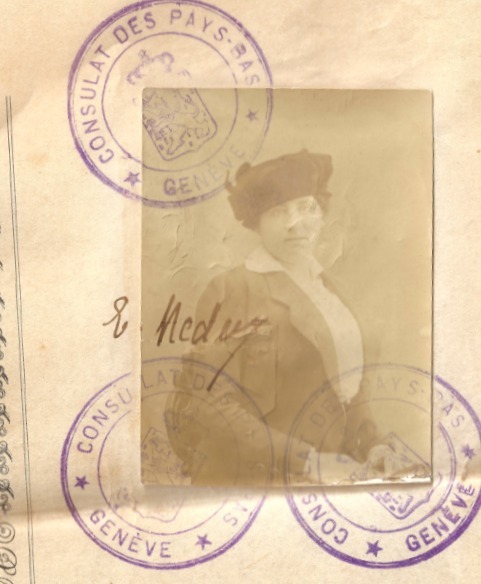 On 16 August 1915, during World War I, Jean and Dominica obtained permission to travel in Switzerland, Italy, and France from the Consulate of the Netherlands in Geneva. The Consulate issued these papers. 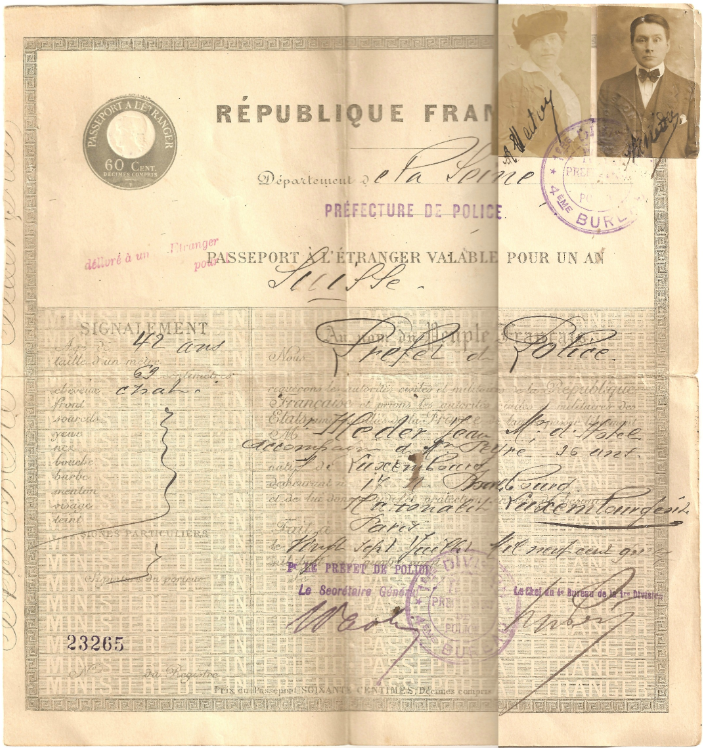 They appear to have then travelled to Paris, France, where on 27 September 1915 they obtained a passport for travel in Switzerland for a one year period. Reverse side of the passport with the stamps from Paris and Lausanne. On 7 July 1920 Jean, maître d’hotel, and Dominica, femme de chambre or maid, became the parents of a daughter Marie Pierette MEDER born in Paris, France. This is an extract they obtained on 29 May 1940. The extract of the 1913 marriage record, this extract of the 1920 birth record of the daughter, as well as Dominica’s extract of her 1878 birth record (below) were all obtained the end of May 1940. As this was during World War II it is very likely that the family was once again in need of passports to travel with their employer. 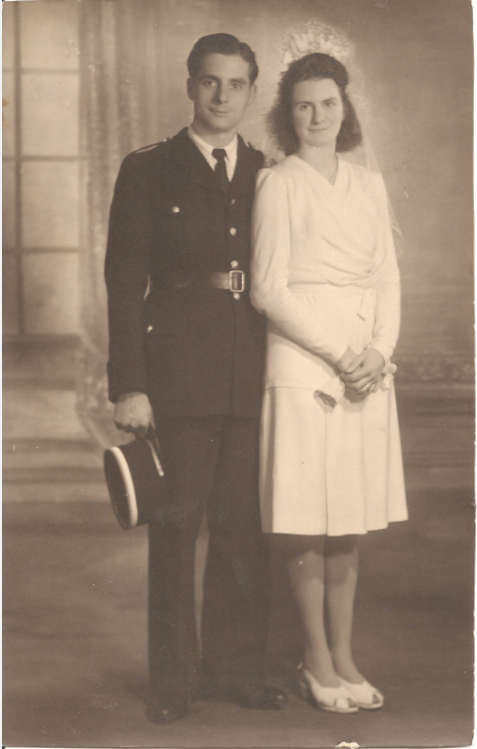 Following the war Pierette married René MEYER on 27 October 1947. It is very likely that they met in the diplomatic circles that her parents’ employers belonged to. René and Pierette lived in Russia while René served a tour of duty there. I located Dominica’s original birth record in the Archives des Pyrénées-Atlantique in Biarritz > Naissances 1873-1882 > image 200 of 379. These records cannot be reproduced without permission. In the margin of the birth record her date of marriage to Jean MEDER as well as her date and place of death were recorded. Dominica died on 29 January 1952 in Kremlin-Bicêtre, Val-de-Marne, Île-de-France, France. It is not known when her husband Jean died. Pierette, the only child of Jean and Dominica, and her husband René did not have children and this line ended with her death in October 1986. 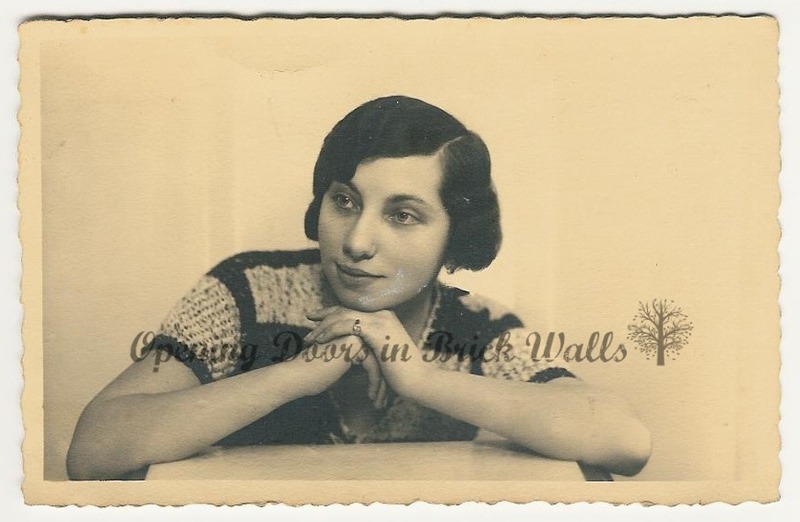 It has always been said that my husband’s grandfather Jean-Pierre MEDER was the youngest of twelve and married the oldest of twelve, Ketty SCHWARTZ. I had to plow through census, birth, marriage, and death records to prove/disprove that the MEDER-FABER family, as tradition goes, had a dozen children. I’m following Thomas MacEntee’s Genealogy Do-Over and the discussions in the Facebook group of the same name. I’m not an “All-in” participant or even a modified participant. I’m willing to learn new things and have already slown down a bit. My blogpost this week became a family group study. I went through every document and extracted as much information as possible. I cited the sources (one of the topics in Week 5) and attached the documents in my genealogy program. I did this slowly, and extractions of the information in the records is reflected in the account below for the family. 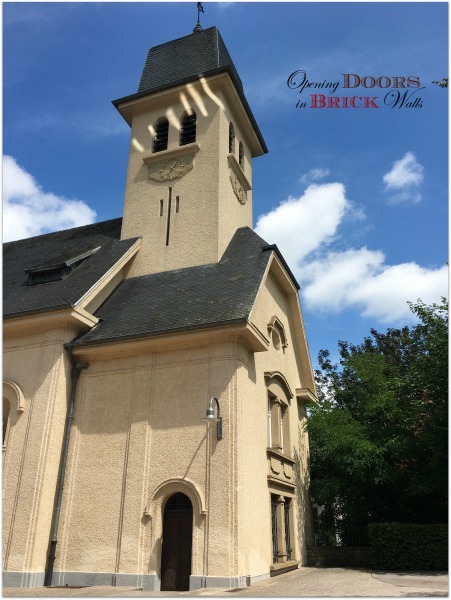 Records for the Meder-Faber family of Diekirch in the beautiful country of Luxembourg span the period from 1846, the year that both of my husband’s great-grandparents were born, until 1954 when their youngest and last living child, my husband’s grandfather, died. Elisabetha FABER was born on the 19th of February 1846 in Diekirch, Luxembourg. Her father Johann FABER, 33 years old stonemason (Steinhauer), reported her birth at 11 o’clock in the morning the following day. Elise, as she was later seen in some records, was born at 11 o’clock in the morning. Her mother Maria LORENTZ was 32 years old. Anton PREUSEN, 55, farmer, and Franz LORENTZ, 34, uncle of the child, were witnesses. Johann-Baptiste DIDIER was the civil officer who recorded the birth. Franz MEDER was born on the 17th of May 1846 in Diekirch, Luxembourg. His father Theodor MEDER, 37 years old day laborer (Taglöhner), reported his birth at at 11 o’clock in the morning the following day. Franz was born at 11 o’clock in the morning. His mother Susanna REIFFER (Reifer on birth record) was 37 years old. Nikolas FOOS and Damian WILLMES were witnesses. Johann-Baptiste DIDIER was the civil officer who recorded the birth. Franz MEDER and Elisabetha FABER were married at 6 o’clock the evening of Monday, 20 September 1869 in Diekirch by the mayor Ernest FRANÇOIS. Franz was 23 and a day laborer (Taglöhner), Elisabetha was 23 and a seamstress (Näherin). Both of Franz’s parents and Elisabetha’s father were present and agreeable to the marriage. Elisabetha’s mother had died in 1851 a week before little Elise’s 5th birthday. Her date of death is seen in her daughter’s marriage record. Marriage banns had been read Sunday the 5th and the 12th of September. 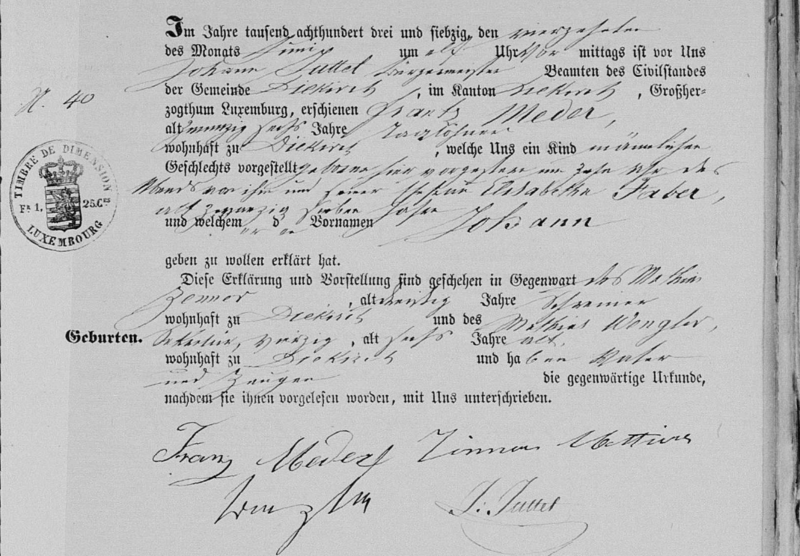 The four witnesses to the marriage were all known to the bridal couple: Franz KREMER, [illegible] WEBER, Mathias WENGLER, and Peter GOEBEL. All persons present, except for the parents of the bridal couple who could not write, signed the marriage record. 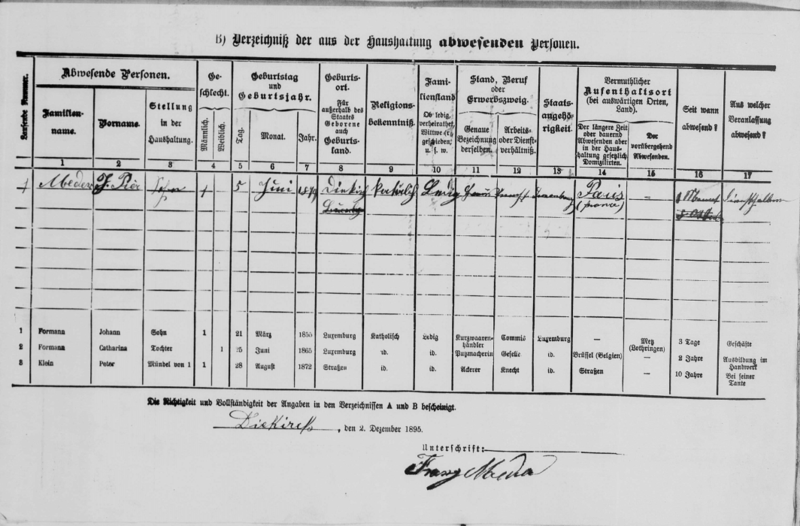 Child #1: Johann MEDER was born on 10 Mar 1870 at 10 o’clock in the morning in Diekirch. His father Franz, a day laborer (Taglöhner), was 23 and his mother Elisabetha was 24. 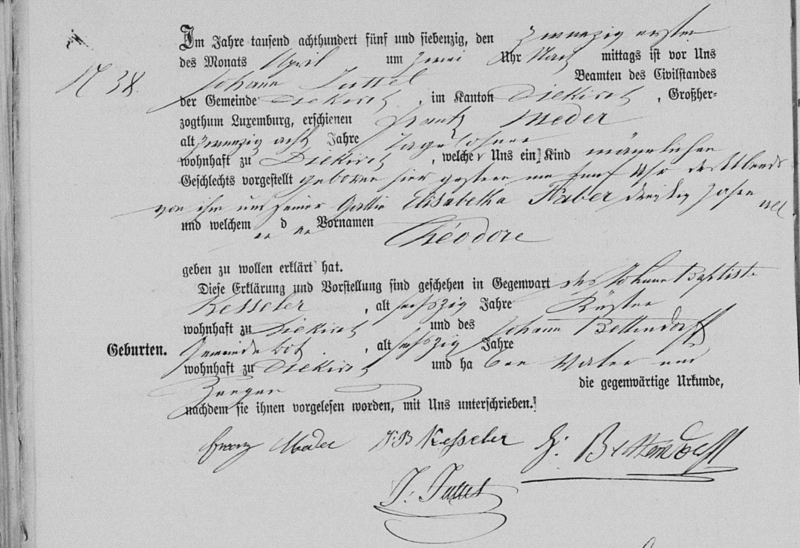 Witnesses to the birth record, filled out the next day by Ernest FRANÇOIS, were Mathias WENGLER and Johan BETTENDORF. The three men were city hall employees. 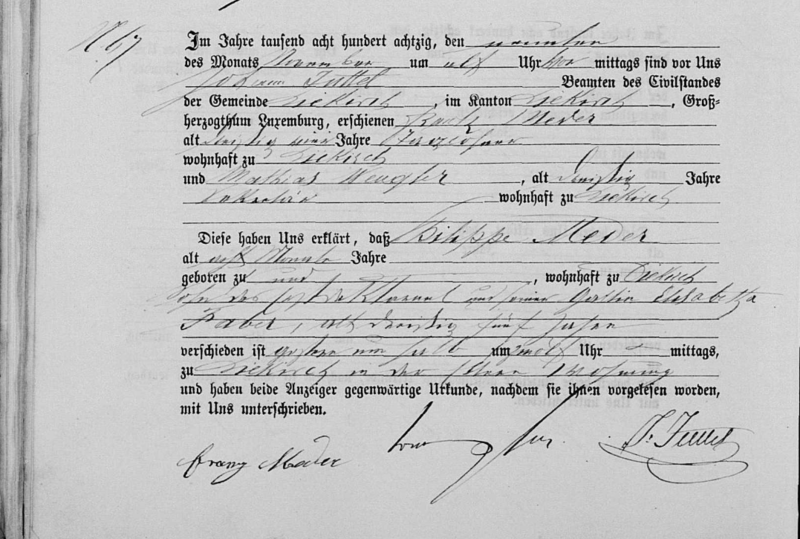 Child #2: Anton MEDER was born at 10 o’clock the evening of 14 October 1871 in Diekirch. The following morning at 11 o’clock his father Franz, 24, day laborer (Taglöhner), informed Nicolas MERGEN that his wife Elizabetha, 25, had given birth to a son who they wanted to name Anton. Mathias WENGLER and Johan BETTENDORF were witnesses. 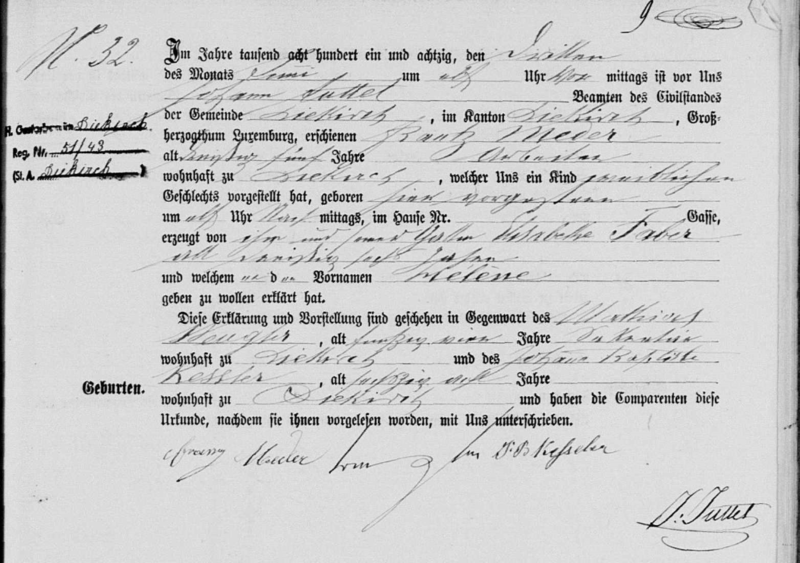 1871 Luxembourg Census for the FABER and MEDER-FABER families who lived in Diekirch. 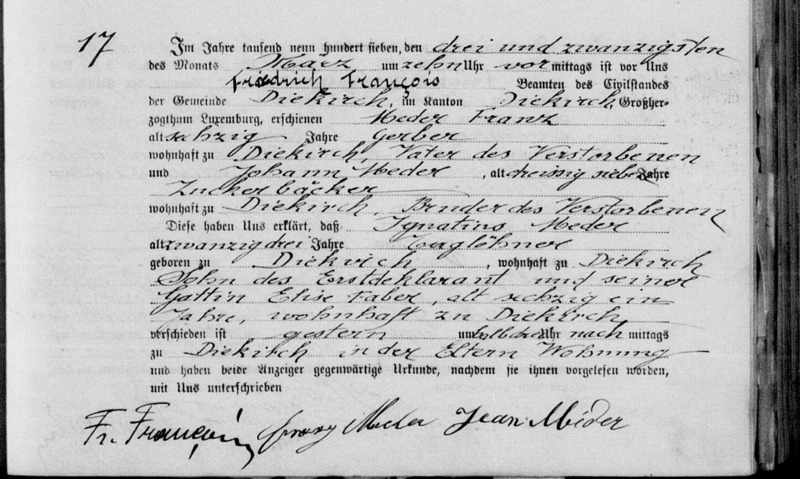 In 1871 Franz (1847) and Elisabetha (1846) are seen for the first time on a census in the same household. The census was enumerated for the night between the 30th of November and the 1st of December and shows two households in one home. Franz and Elisabetha and their two sons (bottom group) are living in the same home as Elisabeth’s parents and two of her sisters (top group). Franz is seen as a day laborer and Elisabetha has no occupation. The sons are listed as Jean (1870) and Joseph (1871). Jean is the French equivalent of Johann but Joseph is not the same as Anton. Joseph and Anton are the same child, Joseph possibly being a baptismal name. It must be noted that Elisabetha was born in February 1846 and Franz in May 1846 making Elisabetha 3 months older than Franz. From May until February the couple would have the same age however in most records, as will be seen here, Elizabeth was seen as being one year older than Franz. 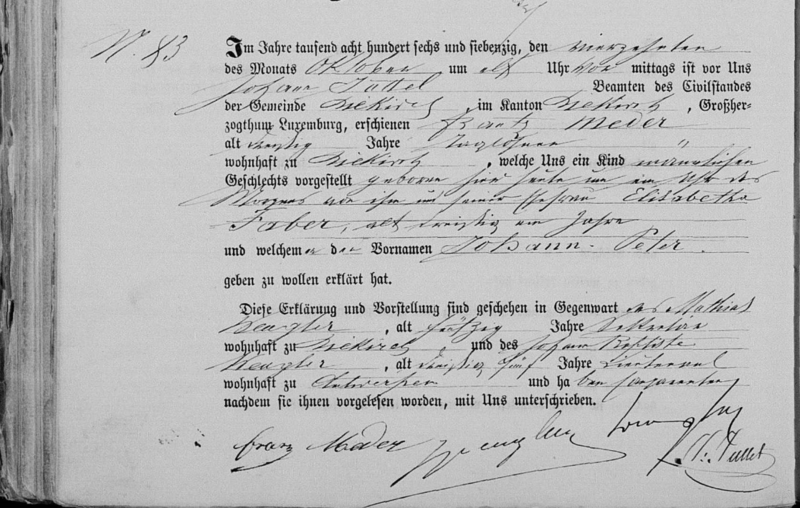 Child #3: Johann Peter MEDER was born at 10 o’clock the evening of 12 June 1873 in Diekirch. Two day later his father Franz, 26, day laborer (Taglöhner), went to the city hall at 11 o’clock in the morning to have the birth of his child by his wife Elizabeth, 27, registered by the mayor Johann JUTTEL. Mathias ZENNER, 30, carpenter (Schreiner), and Mathias WENGLER, 46, city hall secretary (Sekretär), were witnesses. Child #4: Théodore MEDER was born at 5 o’clock the evening of 20 Apr 1875 in Diekirch. The following day his father Franz, 28, day laborer (Taglöhner), went to the city hall at 2 o’clock in the afternoon to have the birth of his child by his wife Elizabetha, 30, registered by the mayor Johann JUTTEL. Johann Baptiste KESSLER, 60, church officer (Köster) and Johann BETTENDORFF, 60, town crier/messenger (Gemeindebote), were witnesses. 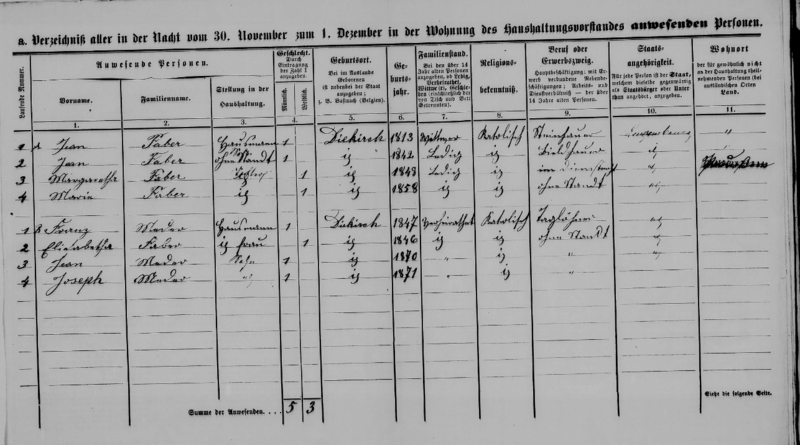 In 1875 Franz (1847) and Elisabetha (1846) are seen on the 1875 census with their four sons: Johann (1869), Joseph (1871), Joh. Peter (1872), and Théodore (1875). Franz’s occupation was listed as Gerbergesell or tanner. 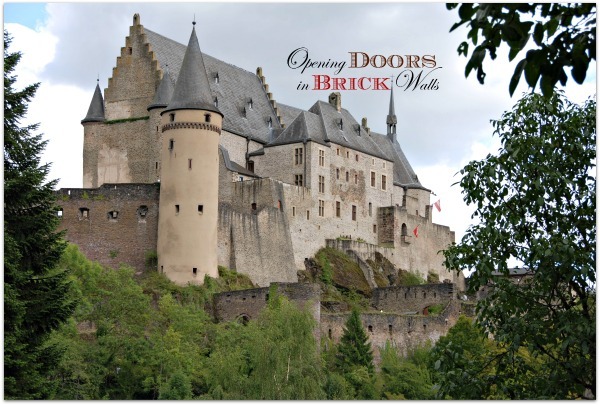 All members of the household were born in Diekirch, of Catholic faith, and Luxembourg nationals. The census was enumerated for the night between the 30th of November and the 1st of December. The years of birth do not all match the birth records found but are within a year of the true date. 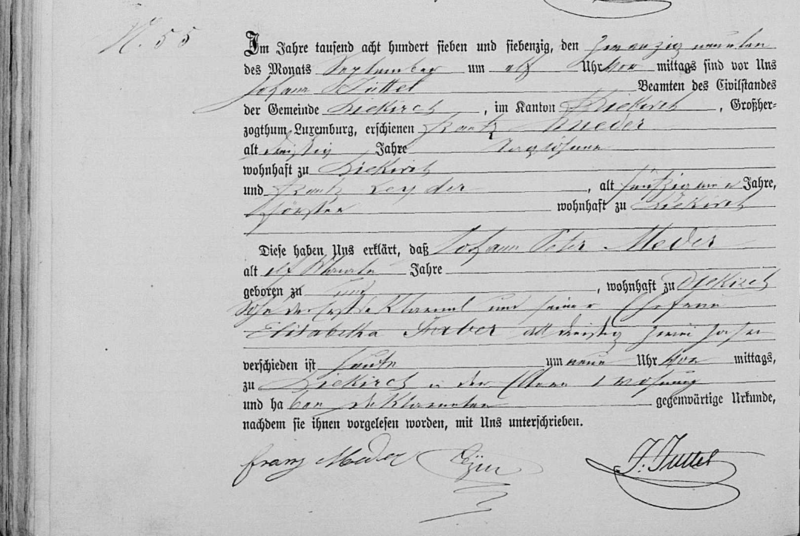 Child #5: Johann Peter MEDER was born at 1 o’clock in the morning of 14 October 1876 in Diekirch. His father Franz, 30, day laborer (Taglöhner), went to the city hall at 11 o’clock the same day to declare his birth to Johann JUTTEL, mayor. The mother Elisabetha was 31. Witnesses were the city hall secretary Mathias WENGLER, 50, (Sekretär), and his brother Johann Baptiste WENGLER, 35, who appears to have been visiting as his residence was listed as Antwerp (Belgium). Eleven months later Franz, 30, once again made a visit to the city hall at 11 o’clock to declare the death of his second son named Johann Peter on 29 September 1877 in their home in Diekirch at 9 o’clock in the morning. Franz LEYDER, 59, forester (Förster), accompanied him, or was present in the city hall, and Johann JUTTEL was the person who filled in the death record. Elisabetha, the mother, was listed as 32. Whent his child died Elisabetha was pregnant with her next child. 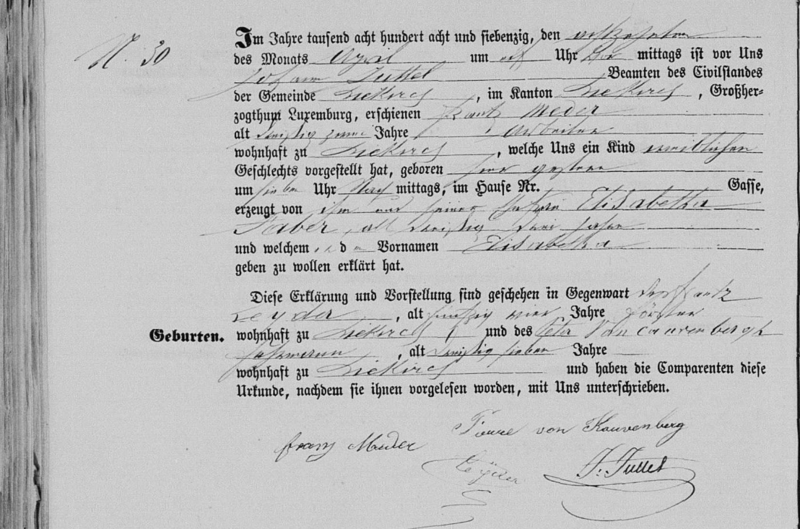 Child #6: Elisabetha MEDER was born at 7 o’clock in the afternoon of 17 April 1878 in Diekirch. Her father Franz, 32, worker (Arbeiter), went the next day at 11 o’clock to the city hall to declare the birth to Johann JUTTEL. The mother Elisabetha was 33. Witnesses were Franz LEYDER, 54, forester (Förster), and Peter VAN KAUVENBERG, 37, coacher (Fuhrmann). 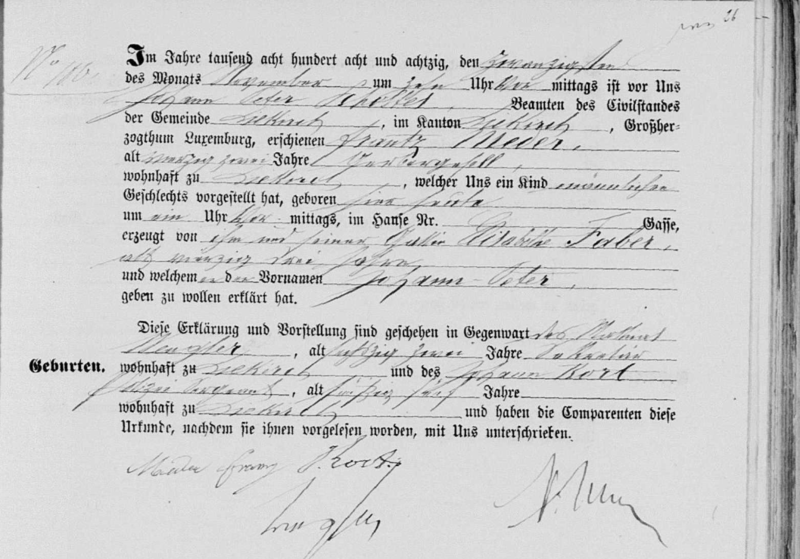 The next record in the birth register was for Peter Van Cauvenbergh’s son Peter which would explain his presence when Franz registered his daughter. It is interesting to view records recorded the same day as they can help to answer questions about the relationship of the witnesses to the claimant. 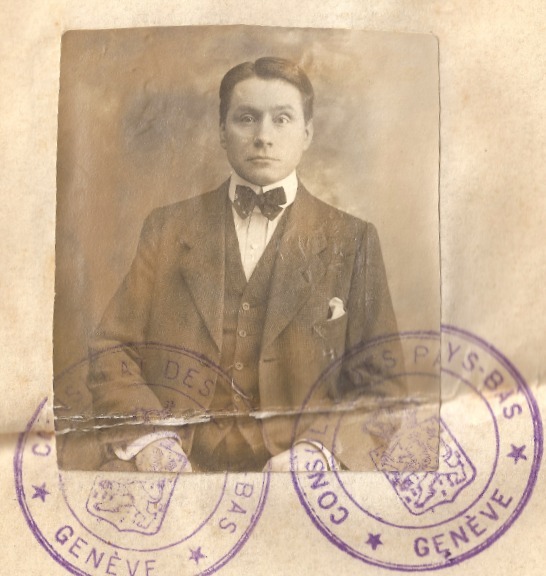 Child #7: Philippe MEDER was born on 4 April 1880 at 10 o’clock in the evening in Diekirch. Franz, 34, worker (Arbeiter), gave the information to Johann JUTTEL two days later at 11 o’clock in the morning. The mother Elisabetha was 35. Witnesses were Mathias WENGLER, 54, secretary (Sekretär), (note: Mr. Merten signed, not Mr. Wengler) and Johann Peter DELOOS, 35. Philippe died at noon on 8 November 1880 in his parents’ home. His father Franz, 34, day laborer (Taglöhner), made the declaration on the 9th. Philippe was in his 8th month at the time of his death and his mother Elizabetha was 35. Witness was Mathias WENGLER, secretary (Sekretär), who was listed as age 30, most likely an error as the person of the same name who has been seen as city hall secretary was older and listed as 54 in the next death record. Johann JUTTEL was once again the person who took the information for the record. Elisabetha may have already been pregnant with her next child. In 1880 the census was again taken for the night of 30 November to 1 December 1880. Along with Franz, Elisabetha, and their five living children (Johann, Joseph, Johann Peter, Théodore, and Elise) we see Franz’s widowed father Théodore living in the household. Child #8: Hélène MEDER was born at 11 o’clock in the evening on 1 June 1881 in Diekirch. Her father Franz, 35, worker (Arbeiter), went to the city hall two days later, on the 3rd at 11 o’clock in the morning and once again met with Johann JUTTEL to register the birth of the child born to his wife Elisabetha, 36. Witnesses were Mathias WENGLER, 54, secretary (Sekretär), and Johann Baptiste KESSLER, 68. Child #9: Heinrich MEDER was born the morning of 2 March 1883 at 5 o’clock in Diekirch. 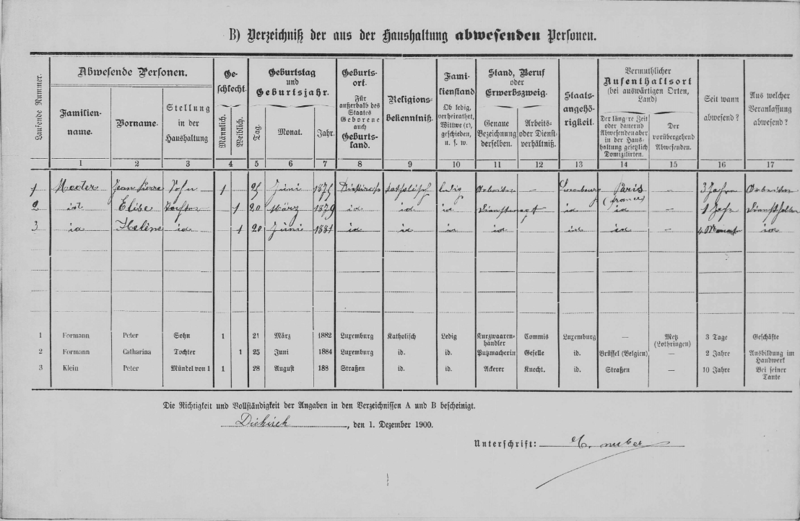 Johann JUTTEL was the civil servant who filled out his birth record the same afternoon at 2 o’clock with the information the father Franz, 36, tanner (Gerbergesell), gave for the child and the mother Elisabetha, 36. Witnesses were Mathias WENGLER, 56, secretary (Sekretär) and Johann KORT, 49, a police officer. 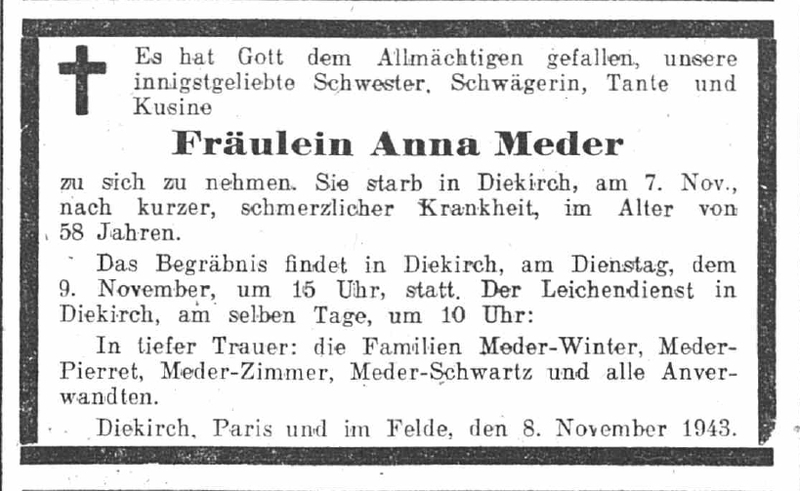 Child #10: Anna MEDER was born at 10:30 in the evening of 12 July 1885 in Diekirch. Her father Franz, 39, tanner (Gerbergesell) met with Johann Peter SCHOLTES the next morning at 11 o’clock to register the birth of the daughter born to his wife Elisabetha, 40. Witnesses were Johann KORT, 51, a police officer, and Jacob MERTEN, 39, church officer (Köster). When compared to the birth records seen above all of the birthdates are off except for the oldest son Jean. Daughter Hélène is seen with the German variation of her name, Magdalena. Son Heinrich is now seen as “Ignatus” which may have been one of his baptismal names. As will be seen in later census records this son was only seen as Heinrich on his birth record and as Ignatius (or some form of this name) in all other records. In 1887 the census was taken on the 1st of February instead of the usual 1st of December. The persons in the household did not change from 1885 to 1887 although some names had different spelling variations. Ignatus name was listed as Ignace. Child #11: Johann Peter MEDER was born at 1 o’clock the morning of 20 November 1888 in Diekirch. His father Franz, 42, tanner (Gerbergesell), went to the city hall the same morning at 10 o’clock to register his son with Johann Peter SCHOLTES. The mother Elizabetha was 43. Witnesses were Mathias WENGLER, 63, secretary, and Johann KORT, 55, a police officer. Note: This is the second living son with this name. In the census in 1890 and 1895 he is seen as Peter and then as Johann Peter in 1900 when his older brother Johann Peter was living and working in Paris, France. On the 1890 census Franz and Elise, as Elisabetha was listed, had in their household their children Joseph, Joh. Peter, Elise, Hélène, Ignace, Anna, and Peter. Their oldest sons Johann and Théodore were not at home. The Luxembourg census has Control Lists with the names of the heads of household. These are helpful when finding families however when young persons were apprenticed they may have lived with the employer’s family. FamilySearch has nearly 1,700 images for the town of Diekirch for 1890. I have not gone through page by page for the missing sons as they show up once again in later years. Franz and Elisabetha’s oldest son was the first to marry. Johann MEDER was 25 and a confectioner (Zuckerbäcker) when he married Cathérine ZIMMER, 21 and a maid (Dienstmagd) on 23 September 1895 at 7 o’clock in the evening. Both of Johann’s parents, Cathérine’s mother, four witnesses, and the alderman who performed the civil ceremony were present and all appear to have signed the marriage record (below) except for Johann’s mother Elisabetha FABER. 1895 Luxembourg Census: Meder-Faber household No. 84 in Diekirch. 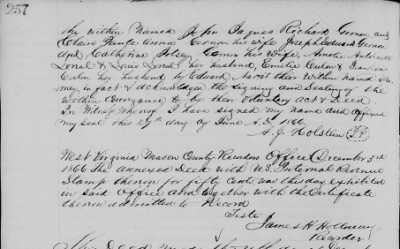 Page with persons who belonged in the household but were not living in it at the time of census. 1900 Luxembourg Census: Meder-Faber household No. 82 in Diekirch. 1900 Luxembourg Census: Meder-Faber household No. 82 in Diekirch. Page with persons who belonged in the household but were not living in it at the time of census. 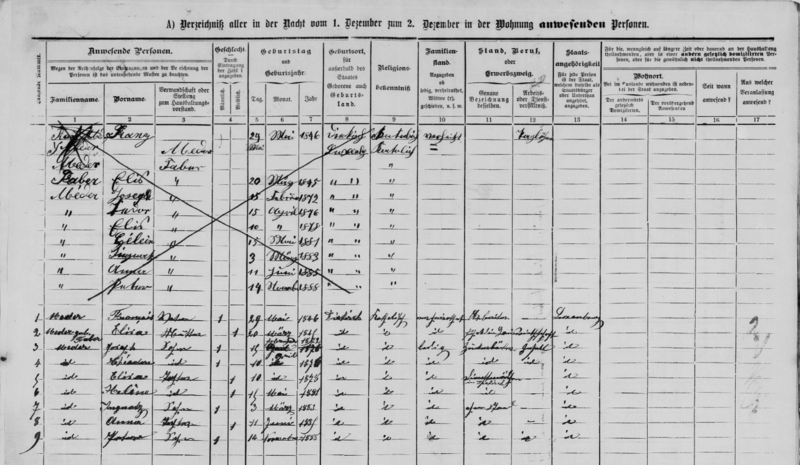 By the time the 1900 census was enumerated the children of Franz and Elisa were older but still living in the parental home. Joseph, Théodore, and Ignace were workers. 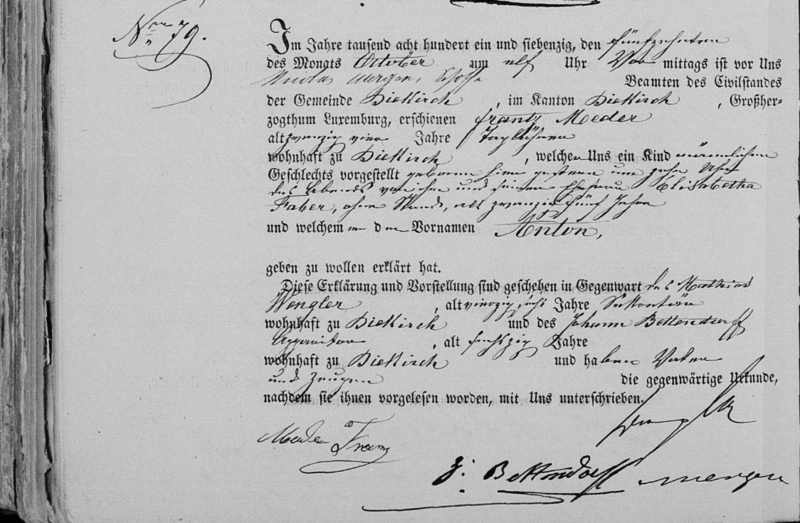 Anna and Johann Peter, the youngest, most likely were still in school as they did not have an occupation listed. Three of the children, although they belonged in the household, were now in Paris, France: Johann Peter (the elder) had been working there 3 years; Elise had been in service for a year and Hélène for 4 months. Son Johann was living next door or perhaps in the same house in household No. 81 with his wife and three children. Théodore MEDER, 29, a worker (Arbeiter) married Magdalena ZIMMER, 26, no occupation, on 28 May 1904 at 5 o’clock in the afternoon. Magdalena was the sister of Cathérine ZIMMER who married Théodore’s brother Johann in 1895. Théodore’s parents Franz and Elisabetha and Magdalena’s mother were present and consenting to the marriage. The four witnesses were not relatives of either the bride or groom. On the morning of 23 March 1907 at 10 o’clock in the morning Franz MEDER, 60, tanner (Gerber), and his oldest son Johann MEDER, 37, confectioner (Zuckerbäcker), went to the Hotel de Ville (city hall) in Diekirch to declare the death of Ignatius who had died at 2:30 in the afternoon the previous day. Friedrich FRANÇOIS was the civil servant who took the information. Anton MEDER, 34, a worker (Arbeiter) married Marguerite WINTER, 25, were married 29 August 1908 at 11 o’clock in the morning by Felix REDING, alderman (Schöffen) as the mayor was not available. Anton’s parents Franz and Elisabetha were both present and consenting to the marriage. Marguerite’s parents were both deceased and their dates of death were given on the marriage record. Two of the witnesses were not relatives and the other two were Anton’s brothers Johann, 38, and Théodore, 32. 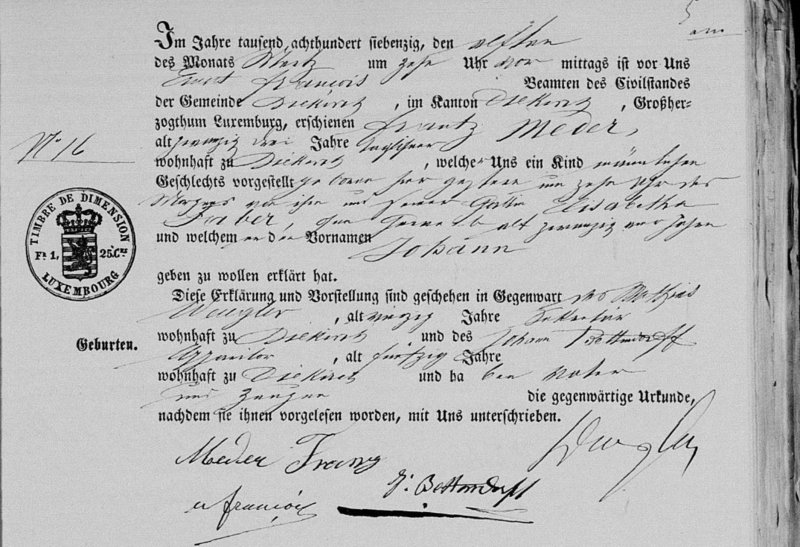 Note: As all persons present signed the marriage record, this document has the signatures of the parents, Franz and Elizabetha, and three of their sons. Elisabetha MEDER died at 4 o’clock in the afternoon of 21 February 1910 in her parents’ home in Diekirch. Her father Franz, 63, worker (Arbeiter), declared the death the next day at 9 o’clock in the morning to the mayor Peter PEMMERS of Diekirch. Johann BOEHM, civil servant (Apparitor) was a witness. The deceased was listed as Elise MEDER age 31 and without occupation. The mother was listed as Elise FABER age 64 and without an occupation. Five years later the mother of this family, Elisabetha FABER died at 12:30 in the early morning of 28 February 1915 in her home in Diekich. Her husband Franz MEDER, 68, street worker (Strassenarbeiter) and her youngest son Johann Peter MEDER, 26, brewery worker (Brauarbeiter), declared her death to Peter PEMMERS the same morning at 10 o’clock. She was listed as Elise FABER, 69, without occupation, daughter of the deceased Mr. and Mrs. (Eheleute) Johann FABER-LORENTZ and wife of Franz MEDER. Although the title is Luxembourg Civil Registration 1662-1941 for the FamilySearch database, most records are availabe only for up to 1923. I haven’t taken the time to visit the city halls for records after 1923 and have to rely on other sources. 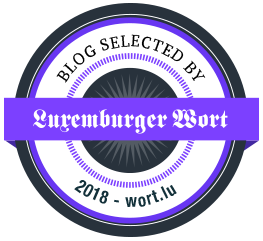 Rob Deltgen has compiled information for Diekirch for the time period 1796-1923 and has a website (access only with password) with information on persons who died beyond this period. Franz’s oldest son Johann MEDER died 13 May 1928 in Eppeldorf. He left six living children and his widow who remarried in 1936 and was widowed again in 1950. Seven years after he was present for his youngest son’s marriage Franz MEDER died 7 September 1930 at the age of 84 in Diekirch. The next death in the family was that of Miss Hélène MEDER who died on Thursday 17 April 1943. She was buried two days later in the cemetery in Diekirch. Her date of death was annotated on her birth record and an announcement was found in the Luxemburger Wort. She was 61 years old. 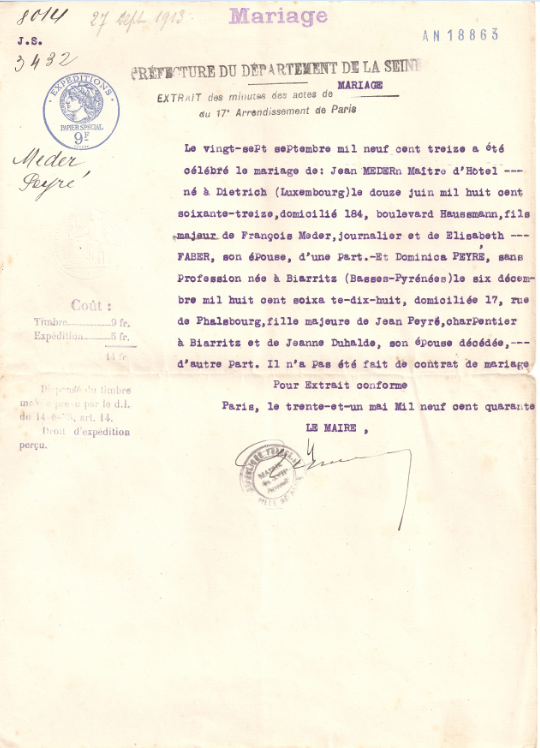 Théodore MEDER died on Tuesday, 21 January 1947, at 9:30 in the evening after a long illness. He was in his 72nd year. He left a widow, five sons, and two grandchildren. At least 4 more grandchildren would be born. In the three death announcements the places that the families lived begin with Diekirch, were they lived, and is followed by Paris. As you will remember from the census records discussed earlier, three of the children went to Paris to work. The girls, Hélène and Anna, returned to Diekirch but until I made a phone call to my husband’s cousin I had no idea what happened to the elder son named Johann Peter b. in 1873. Johann Peter, the elder, remained in Paris, married and had at least one child, a daughter Pierette who was born ca. 1920-1925. I suspected this but needed confirmation. I met Pierette and her husband in the late 1970s or early 1980s when they came from France to visit with my husband’s uncle Fritz and we saw them several times before Pierette’s death. At the time I knew that she was Fritz’s and my father-in-law’s cousin. By process of elimination, I figured out that she had to be the daughter of the elder Johann Peter. My husband’s cousin confirmed that Pierette was the daughter of the brother who lived in Paris but she does not know when he died. My husband’s grandfather Johann Peter (also known as Jean-Pierre) MEDER was the last of the 11 children. He died 23 February 1954 in Diekirch. What was that I said in the beginning about plowing through the records to prove there were a dozen children? Looks like there were only eleven! As the years went by the son Anton was always seen as Joseph on the census with his parents. It is possible that Joseph was one of his baptismal names. 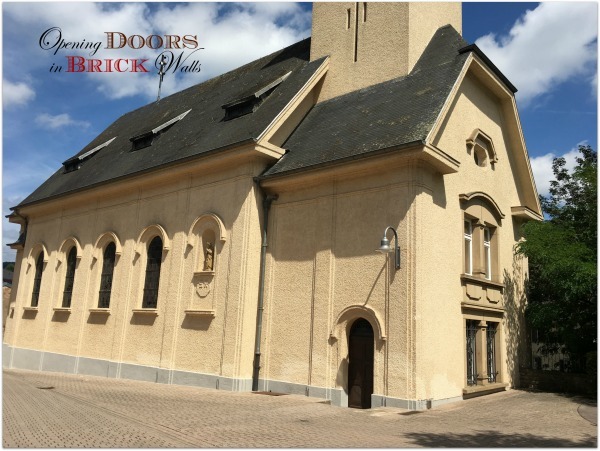 Luxembourg, Church Records, 1601-1948 went online earlier this month however the time period for this family is not yet available. The Luxembourg census is not always very reliable when it comes to dates of birth as was seen above. The birth year of “Joseph” as he was seen on the census varied from 1871 to 1874. Later when he married and when his children were born he was seen as Anton. The son who was registered as Heinrich was later seen as Ignatius on the census and this is the name which was used on his death record. I believe that family members who have said that the family had a dozen children may have counted Anton (Joseph) or Heinrich (Ignatus) twice. I know that at one time I had all of these names listed and the number of children was 13. Finally, while I was talking to my husband’s cousin I asked her about the number of children. She said that she remembered tales of a child who died at birth. So back to the death records, I go to check if there may have been a stillbirth that I missed. Luxembourg, Registres d’état civil, 1793-1923 (images), FamilySearch (original records at Luxembourg National Archives, Plateau du Saint-Esprit, Luxembourg), Diekirch > Naissances 1823 > image 562 of 1507. “1846 Birth Record No. 13.” (https://familysearch.org/pal:/MM9.3.1/TH-267-11681-35573-94?cc=1709358&wc=M9M6-2NV:n960823085 : accessed 01 Apr 2013). Luxembourg, Registres d’état civil, 1793-1923 (images), FamilySearch (original records at Luxembourg National Archives, Plateau du Saint-Esprit, Luxembourg), Diekirch > Naissances 1823 > image 569 of 1507. “1846 Birth Record No. 39.” (https://familysearch.org/pal:/MM9.3.1/TH-267-11681-27954-74?cc=1709358&wc=M9M6-2NV:n960823085 : accessed 01 Apr 2013). Luxembourg, Registres d’état civil, 1793-1923 (images), FamilySearch (original records at Luxembourg National Archives, Plateau du Saint-Esprit, Luxembourg), Diekirch > Mariages 1843-1890 Décès 1797-1824 > image 562 of 1493. “1869 Marriage Record No. 12.” (https://familysearch.org/pal:/MM9.3.1/TH-267-12052-48904-35?cc=1709358&wc=M9M6-2ND:n1913802954 : accessed 01 Apr 2013). Luxembourg, Registres d’état civil, 1793-1923 (images), FamilySearch (original records at Luxembourg National Archives, Plateau du Saint-Esprit, Luxembourg), Diekirch > Naissances 1823 > image 1246 of 1507. “1870 Birth Record No. 16.” (https://familysearch.org/pal:/MM9.3.1/TH-267-11681-32541-22?cc=1709358&wc=9RY4-BZ9:129628901,130131601 : accessed 18 March 2010). Luxembourg, Registres d’état civil, 1793-1923 (images), FamilySearch (original records at Luxembourg National Archives, Plateau du Saint-Esprit, Luxembourg), Diekirch > Naissances 1823 > image 1287 of 1507. “1871 Birth Record No. 79.” (https://familysearch.org/pal:/MM9.3.1/TH-267-11681-31930-97?cc=1709358&wc=9RY4-BZ9:129628901,130131601 : accessed 18 March 2010). Luxembourg, Volkszählungen 1843-1900 (images), FamilySearch, (original records at Luxembourg National Archives, Plateau du Saint-Esprit, Luxembourg), Diekirch > 1871 > image 1358 of 1420. “Faber-Lorentz and Meder-Faber households No. 18 & 19.” https://familysearch.org/pal:/MM9.3.1/TH-1971-32382-18356-48?cc=2037957&wc=M5GS-ZNP:345999901,345869501 : accessed 7 January 2015). Luxembourg, Registres d’état civil, 1793-1923 (images), FamilySearch (original records at Luxembourg National Archives, Plateau du Saint-Esprit, Luxembourg), Diekirch > Naissances 1823 > image 1333 of 1507. “1873 Birth Record No. 40.” (https://familysearch.org/pal:/MM9.3.1/TH-267-11681-35167-8?cc=1709358&wc=9RY4-BZ9:129628901,130131601 : accessed 18 March 2010). Luxembourg, Registres d’état civil, 1793-1923 (images), <i>FamilySearch</i> (original records at Luxembourg National Archives, Plateau du Saint-Esprit, Luxembourg), Diekirch > Naissances 1823 > image 1389 of 1507. “1875 Birth Record No. 38.” (https://familysearch.org/pal:/MM9.3.1/TH-267-11681-33342-21?cc=1709358&wc=9RY4-BZ9:129628901,130131601 : accessed 18 March 2010). Luxembourg, Volkszählungen 1843-1900 (images), FamilySearch, (original records at Luxembourg National Archives, Plateau du Saint-Esprit, Luxembourg), Diekirch > 1875 > image 305, 306, & 307 of 1488. “Meder-Faber household No. 80.” (https://familysearch.org/pal:/MM9.3.1/TH-1961-32379-21229-50?cc=2037957&wc=M5G9-SPK:345999901,345870501 : accessed 7 January 2015). Luxembourg, Registres d’état civil, 1793-1923 (images), <i>FamilySearch</i> (original records at Luxembourg National Archives, Plateau du Saint-Esprit, Luxembourg), Diekirch > Naissances 1823 > image 1439 of 1507. “1876 Birth Record No. 83.” (https://familysearch.org/pal:/MM9.3.1/TH-267-11681-30199-20?cc=1709358&wc=9RY4-BZ9:129628901,130131601 : accessed 18 March 2010). Luxembourg, Registres d’état civil, 1793-1923 (images), <i>FamilySearch</i> (original records at Luxembourg National Archives, Plateau du Saint-Esprit, Luxembourg), Diekirch > Décès 1825-1890 > image 1065 of 1358. “1877 Death Record No. 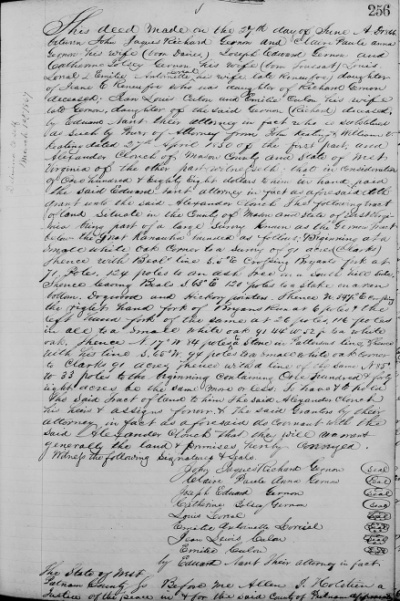 55” (https://familysearch.org/pal:/MM9.3.1/TH-267-12147-169082-70?cc=1709358&wc=9RYC-2NL:129628901,129628902 : accessed 5 January 2015). Luxembourg, Registres d’état civil, 1793-1923 (images), <i>FamilySearch</i> (original records at Luxembourg National Archives, Plateau du Saint-Esprit, Luxembourg), Diekirch > Naissances 1823 > image 1482 of 1507. “1878 Birth Record No. 30.” (https://familysearch.org/pal:/MM9.3.1/TH-267-11681-29947-67?cc=1709358&wc=9RY4-BZ9:129628901,130131601 : accessed 18 March 2010). Luxembourg, Registres d’état civil, 1793-1923 (images), <i>FamilySearch</i> (original records at Luxembourg National Archives, Plateau du Saint-Esprit, Luxembourg), Diekirch > Naissances 1879-1890 Mariages 1796-1842 > image 43 of 1492. “1880 Birth Record No. 25.” (https://familysearch.org/pal:/MM9.3.1/TH-267-11618-100350-77?cc=1709358&wc=M9M6-2N2:1627336735 : accessed 17 Feb 2013). Luxembourg, Registres d’état civil, 1793-1923 (images), <i>FamilySearch</i> (original records at Luxembourg National Archives, Plateau du Saint-Esprit, Luxembourg), Diekirch > Décès 1825-1890 > image 1130 of 1358. “1880 Death Record No. 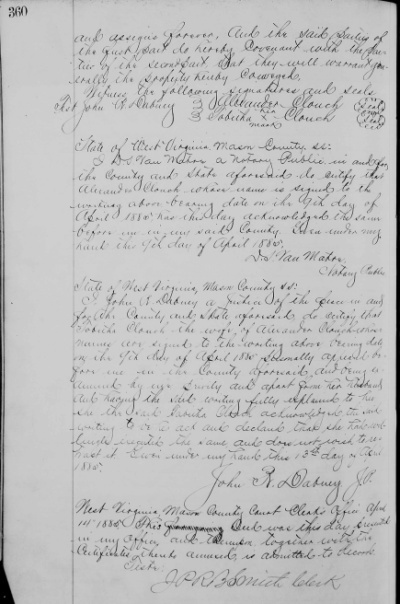 67.” (https://familysearch.org/pal:/MM9.3.1/TH-267-12147-165690-56?cc=1709358&wc=M9M6-2NH:n538876208 : accessed 17 Feb 2013). Luxembourg, Volkszählungen 1843-1900 (images), FamilySearch, (original records at Luxembourg National Archives, Plateau du Saint-Esprit, Luxembourg), Diekirch > 1880 > image 320, 321, & 322 of 1562. “Meder-Faber household No. 85.” (https://familysearch.org/pal:/MM9.3.1/TH-1942-32389-5849-2?cc=2037957&wc=M5GS-GPL:345999901,345872201 : accessed 7 January 2015). 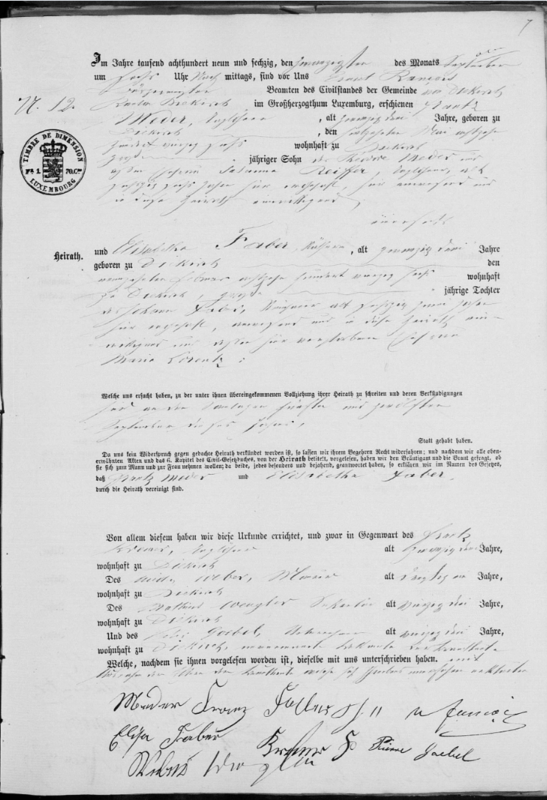 Luxembourg, Registres d’état civil, 1793-1923 (images), <i>FamilySearch</i> (original records at Luxembourg National Archives, Plateau du Saint-Esprit, Luxembourg), Diekirch > Naissances 1879-1890 Mariages 1796-1842 > image 73 of 1492. “1881 Birth Record No. 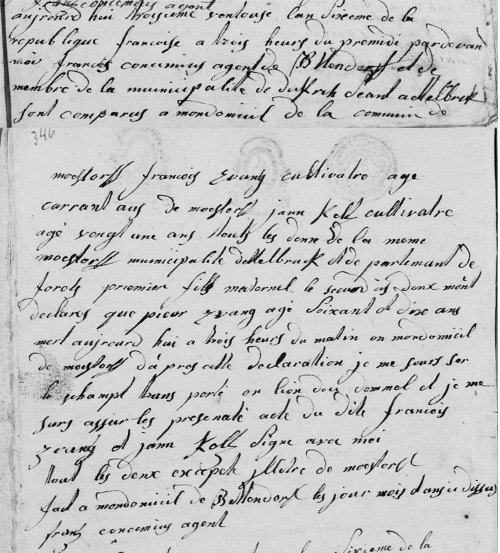 32; includes annotation of death.” (https://familysearch.org/pal:/MM9.3.1/TH-267-11618-106519-76?cc=1709358&wc=9RY4-W38:129628901,130301801 : accessed 18 March 2010). Luxembourg, Registres d’état civil, 1793-1923 (images), <i>FamilySearch</i> (original records at Luxembourg National Archives, Plateau du Saint-Esprit, Luxembourg), Diekirch > Naissances 1879-1890 Mariages 1796-1842 > image 131 of 1492. “1883 Birth Record No. 21.” (https://familysearch.org/pal:/MM9.3.1/TH-267-11618-105020-82?cc=1709358&wc=9RY4-W38:129628901,130301801 : accessed 18 March 2010. Luxembourg, Registres d’état civil, 1793-1923 (images), <i>FamilySearch</i> (original records at Luxembourg National Archives, Plateau du Saint-Esprit, Luxembourg), Diekirch > Naissances 1879-1890 Mariages 1796-1842 > image 200 of 1492. “1885 Birth Record No. 66.” (https://familysearch.org/pal:/MM9.3.1/TH-267-11618-98266-73?cc=1709358&wc=9RY4-W38:129628901,130301801 : accessed 18 March 2010). Luxembourg, Volkszählungen 1843-1900 (images), FamilySearch, (original records at Luxembourg National Archives, Plateau du Saint-Esprit, Luxembourg), Diekirch > 1885 > image 916, 917 & 918 of 1613. “Meder-Faber household No. 8.” (https://familysearch.org/pal:/MM9.3.1/TH-1971-32390-14261-68?cc=2037957&wc=M5G7-W38:345999901,345873701 : accessed 2 January 2015). Luxembourg, Volkszählungen 1843-1900 (images), FamilySearch, (original records at Luxembourg National Archives, Plateau du Saint-Esprit, Luxembourg), Diekirch > 1887 > image 1197, 1198 & 1199 of 1594. “Meder-Faber household No. 66.” (https://familysearch.org/pal:/MM9.3.1/TH-1961-32391-13967-28?cc=2037957&wc=M5G4-3YM:345999901,345875201 : accessed 2 January 2015). Luxembourg, Registres d’état civil, 1793-1923 (images), <i>FamilySearch</i> (original records at Luxembourg National Archives, Plateau du Saint-Esprit, Luxembourg), Diekirch > Naissances 1879-1890 Mariages 1796-1842 > image 297 of 1492. “1888 Birth Record No. 100.” (https://familysearch.org/pal:/MM9.3.1/TH-267-11618-105421-23?cc=1709358&wc=M9M6-2N2:1627336735 : accessed 01 Apr 2013). Luxembourg, Volkszählungen 1843-1900 (images), FamilySearch, (original records at Luxembourg National Archives, Plateau du Saint-Esprit, Luxembourg), Diekirch > 1890 > image 1560, 1561 & 1562 of 1663. “Meder-Faber household No. 78.” (https://familysearch.org/pal:/MM9.3.1/TH-1971-32392-7974-98?cc=2037957&wc=M5GZ-N36:345999901,345876401 : accessed 2 January 2015). Luxembourg, Registres d’état civil, 1793-1923 (images), FamilySearch (original records at Luxembourg National Archives, Plateau du Saint-Esprit, Luxembourg), Diekirch > Mariages 1895-1923 Décès 1895-1902 > image 9 of 661. “1895 Marriage Record No. 12.” (https://familysearch.org/pal:/MM9.3.1/TH-1971-32038-1152-18?cc=1709358&wc=9RTB-92Q:129628901,130043302 : accessed 16 January 2015). Luxembourg, Volkszählungen 1843-1900 (images), FamilySearch, (original records at Luxembourg National Archives, Plateau du Saint-Esprit, Luxembourg), Diekirch > 1895 > image 378, 379 & 380 of 1738. “Meder-Faber household No. 84.” (https://familysearch.org/pal:/MM9.3.1/TH-1951-32395-3034-5?cc=2037957&wc=M5G8-W38:345999901,345878001 : accessed 2 January 2015). Luxembourg, Volkszählungen 1843-1900 (images), FamilySearch, (original records at Luxembourg National Archives, Plateau du Saint-Esprit, Luxembourg), Diekirch > 1900 > image 1177, 1178 & 1179 of 1812. “Meder-Faber household No. 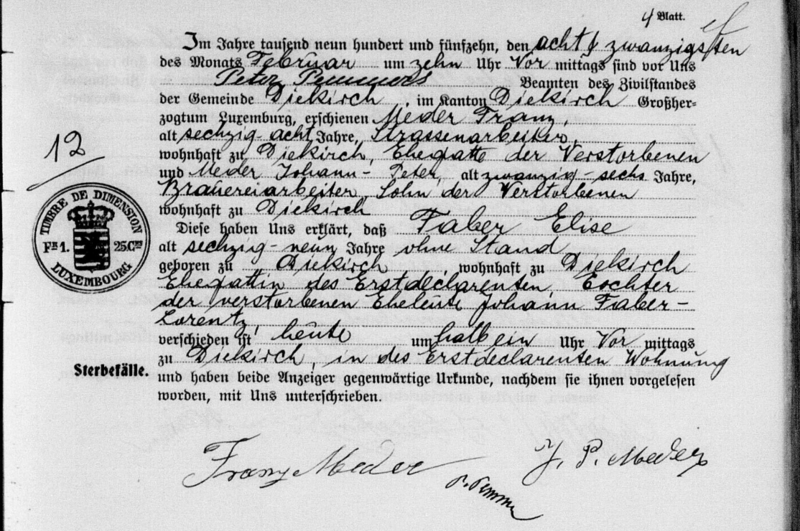 82.” (https://familysearch.org/pal:/MM9.3.1/TH-1942-32397-6228-58?cc=2037957&wc=M9MV-MLX:709480180 : accessed 2 January 2015). 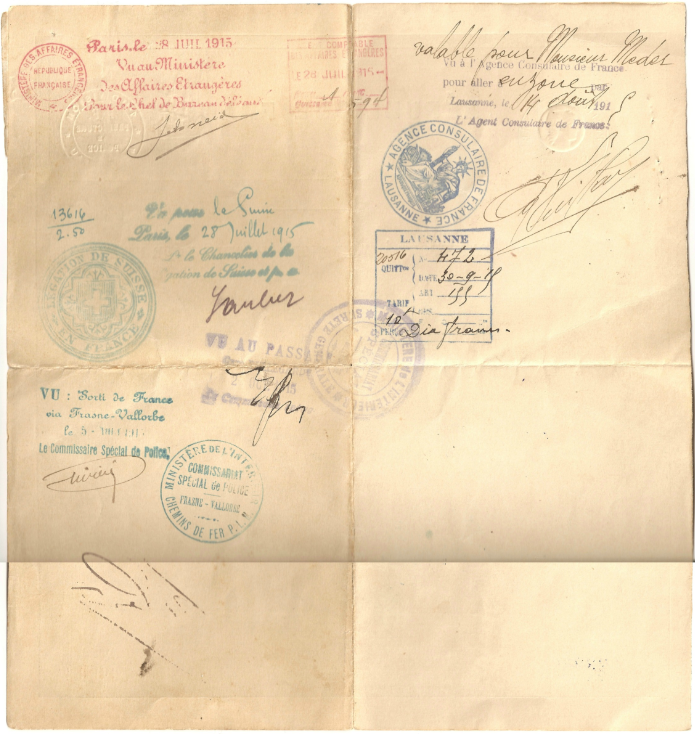 Luxembourg, Registres d’état civil, 1793-1923 (images), <i>FamilySearch</i> (original records at Luxembourg National Archives, Plateau du Saint-Esprit, Luxembourg), Diekirch > Mariages 1895-1923 Décès 1895-1902 > image 133 of 661. “1904 Marriage Record No. 7.” (https://familysearch.org/pal:/MM9.3.1/TH-1942-32038-898-6?cc=1709358&wc=9RTB-92Q:129628901,130043302 : accessed 27 January 2015). Luxembourg, Registres d’état civil, 1793-1923 (images), <i>FamilySearch</i> (original records at Luxembourg National Archives, Plateau du Saint-Esprit, Luxembourg), Diekirch > Décès 1903-1912 > image 96 of 500. “1907 Death Record No. 17.” (https://familysearch.org/pal:/MM9.3.1/TH-1961-32027-18954-62?cc=1709358&wc=9RTY-J4Q:129628901,129787701 : accessed 5 January 2015). 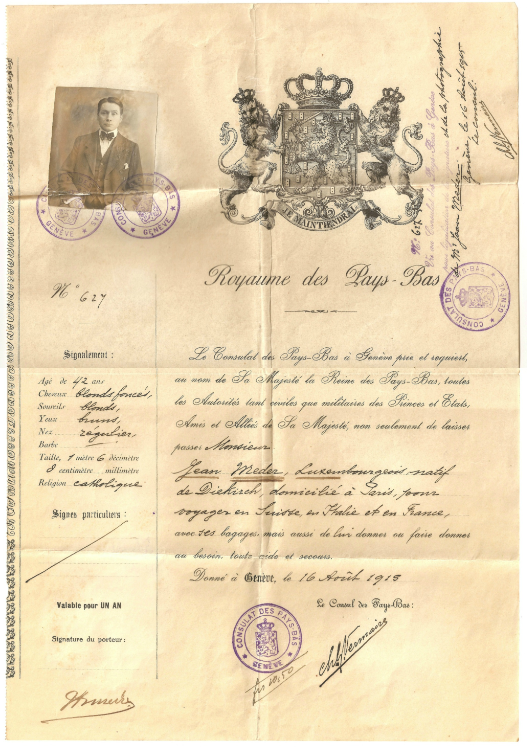 Luxembourg, Registres d’état civil, 1793-1923 (images), <i>FamilySearch</i> (original records at Luxembourg National Archives, Plateau du Saint-Esprit, Luxembourg), Diekirch > Mariages 1895-1923 Décès 1895-1902 > image 201 of 661. “1908 Marriage Record No. 21.” (https://familysearch.org/pal:/MM9.3.1/TH-1951-32038-427-64?cc=1709358&wc=9RTB-92Q:129628901,130043302 : accessed 7 January 2015). Luxembourg, Registres d’état civil, 1793-1923 (images), <i>FamilySearch</i> (original records at Luxembourg National Archives, Plateau du Saint-Esprit, Luxembourg), Diekirch > Décès 1903-1912 > image 180 of 500. “1910 Death Record No. 11.” (https://familysearch.org/pal:/MM9.3.1/TH-1961-32027-19615-86?cc=1709358&wc=9RTY-J4Q:129628901,129787701 : accessed 5 January 2015). Luxembourg, Registres d’état civil, 1793-1923 (images), <i>FamilySearch</i> (original records at Luxembourg National Archives, Plateau du Saint-Esprit, Luxembourg), Diekirch > Décès 1903-1912 > image 292 of 500. “1915 Death Record No. 12.” (https://familysearch.org/pal:/MM9.3.1/TH-1961-32027-19436-87?cc=1709358&wc=9RTY-J4Q:129628901,129787701 : accessed 11 January 2015). 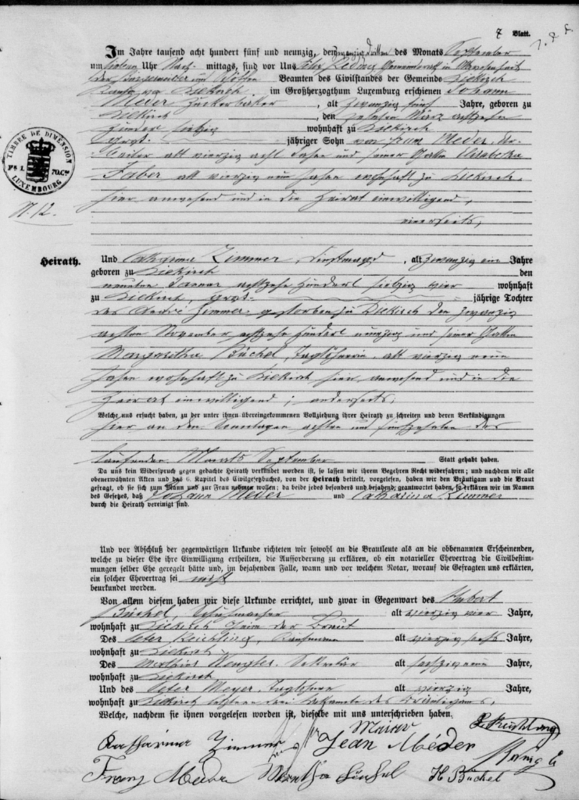 Luxembourg, Registres d’état civil, 1793-1923 (images), <i>FamilySearch</i> (original records at Luxembourg National Archives, Plateau du Saint-Esprit, Luxembourg), Diekirch > Mariages 1895-1923 Décès 1895-1902 > image 461 of 661. “1923 Marriage Record No. 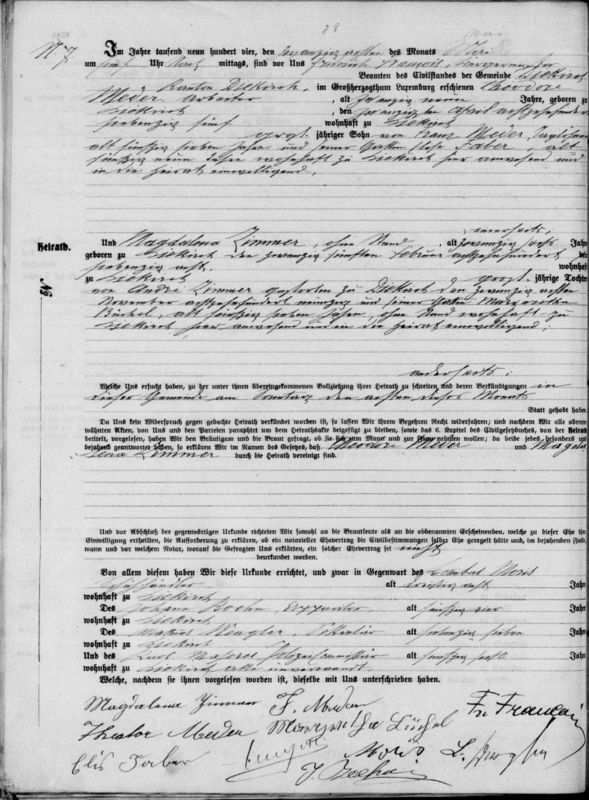 9.” (https://familysearch.org/pal:/MM9.3.1/TH-1971-32037-28712-77?cc=1709358&wc=M9M6-2NF:21518491 : accessed 01 Apr 2013). Rob Deltgen, Diekirch : Komplettes Familienbuch der Gemeinde 1796-1923; Family book compiled from civil records. Covers the locality of Diekirch and, until 1823, also the localities of Bastendorf, Bleesmühle, Clairefontaine, Erpeldange, Gilsdorf, Ingeldorf et Tandel. Period: 1796-1923. Luxemburger Wort, digitized by Bibliothèque nationale de Luxembourg; online http://www.eluxemburgensia.lu (Luxembourg), Friday, April 16, 1943. 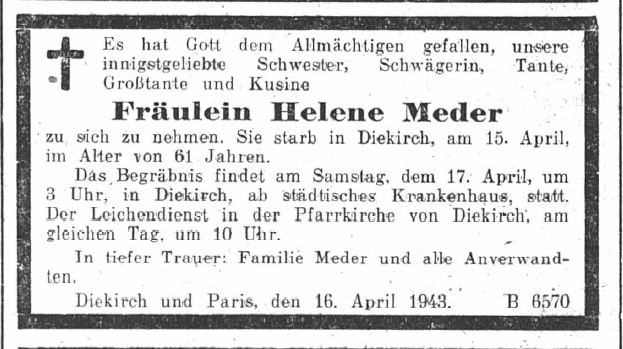 Death announcement of Fräulein Hélène Meder. Luxembourger Wort, digitized by Bibliothèque nationale de Luxembourg; online http://www.eluxemburgensia.lu (Luxembourg), Monday, 8 Nov 1943. Death announcement of Fräulein Anna Meder. Luxembourger Wort, digitized by Bibliothèque nationale de Luxembourg; online http://www.eluxemburgensia.lu (Luxembourg), Wednesday, 22 Jan 1947. 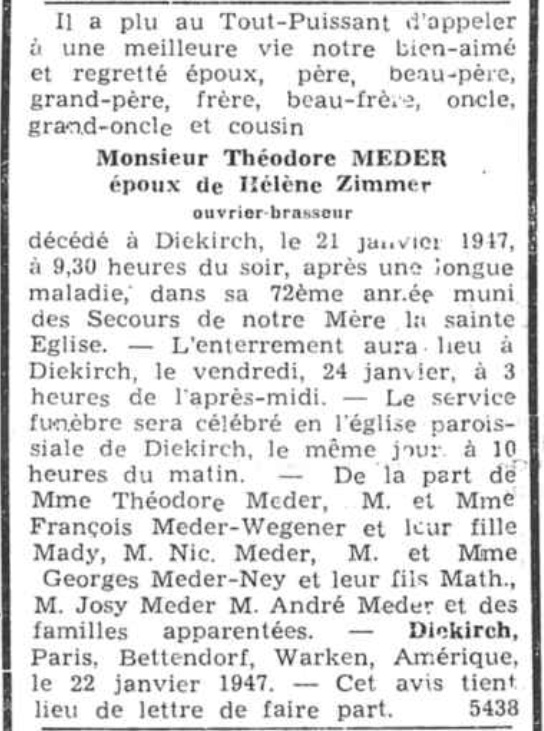 Obituary of Théodore MEDER. Commune de Diekirch Nr. 9/1923, Meder-Schwartz Family Book, page 1, full page. 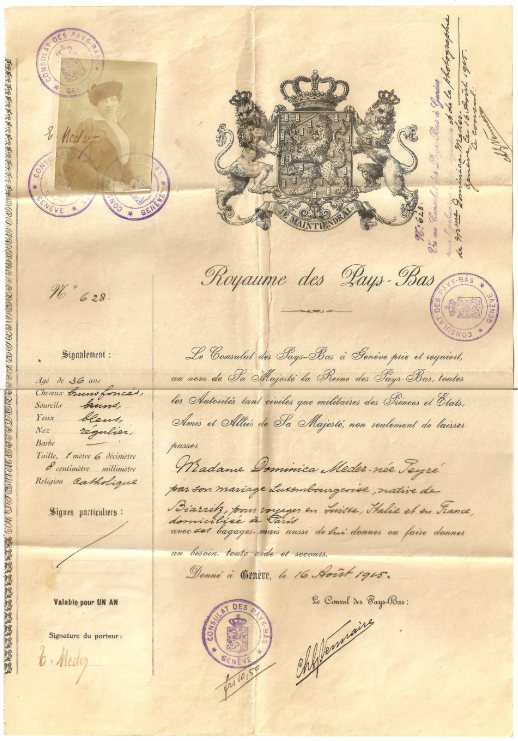 This is an official document given to the bride and groom at the time of their civil marriage. It is used to record births, christenings, and deaths of children as well as death of one or the other spouse. Information on groom and bride; date of death of groom annotated on this page. Original in my possession.